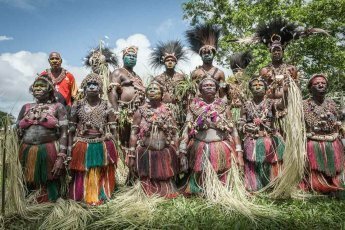 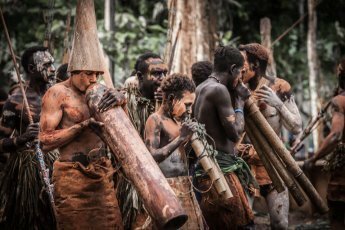 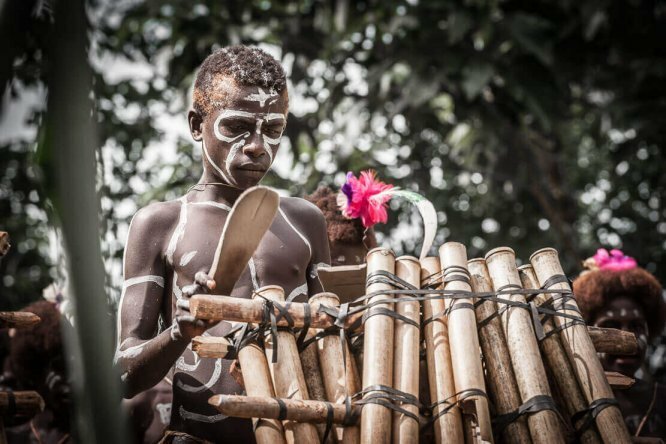 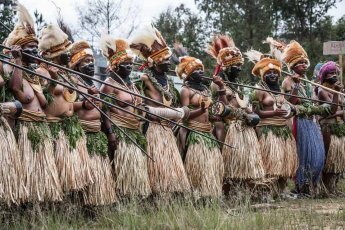 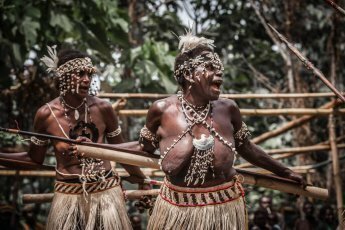 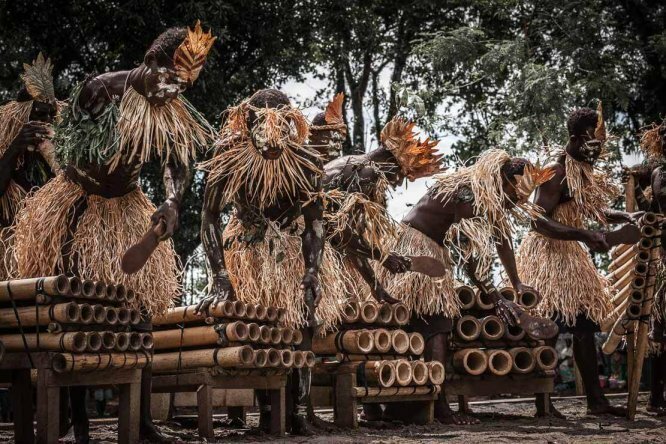 Sing sing group from Enga Province of Papua New Guinea. 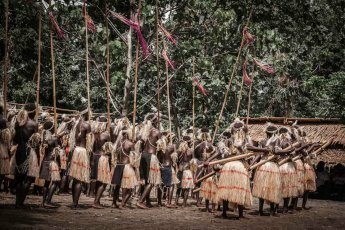 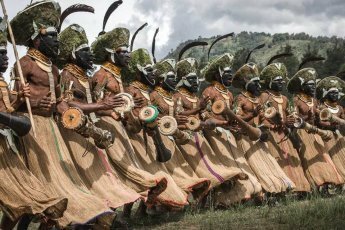 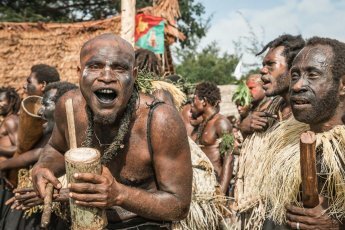 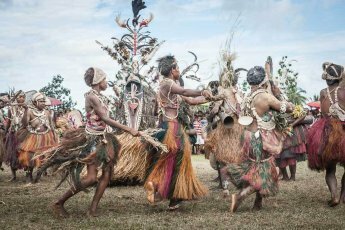 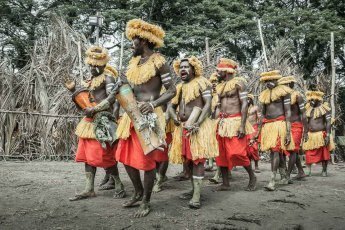 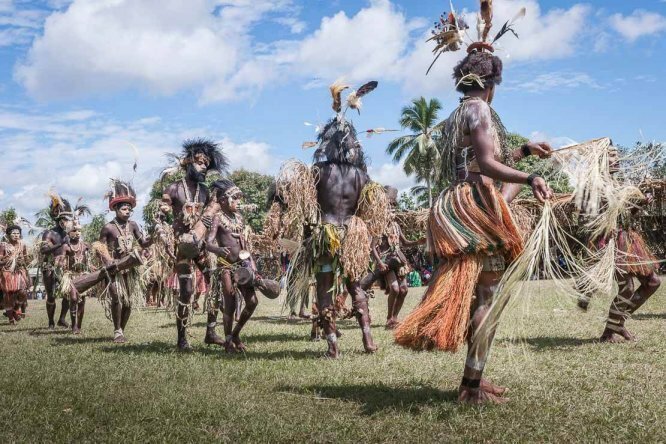 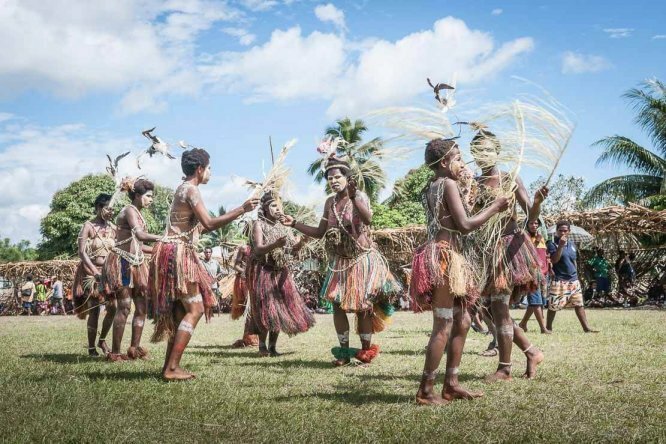 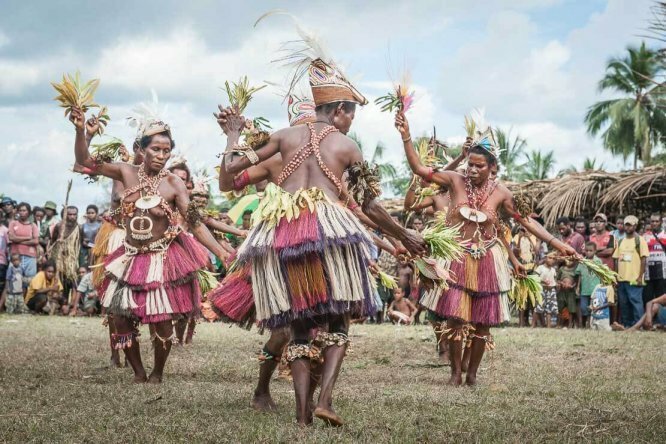 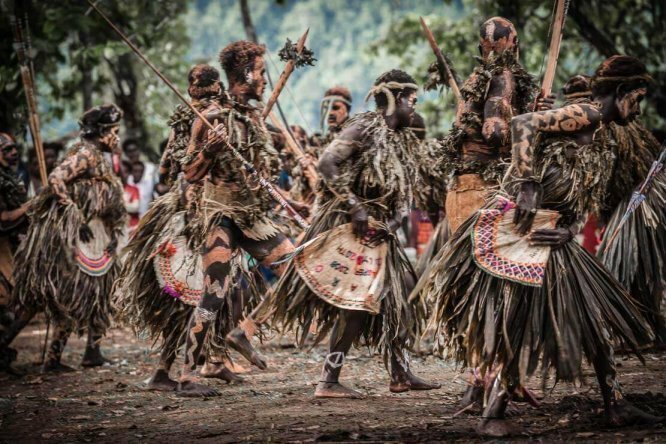 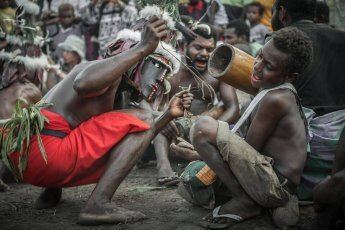 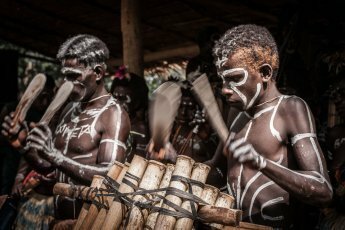 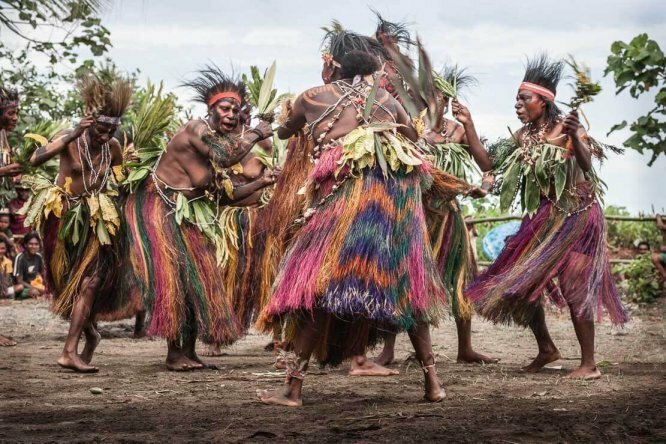 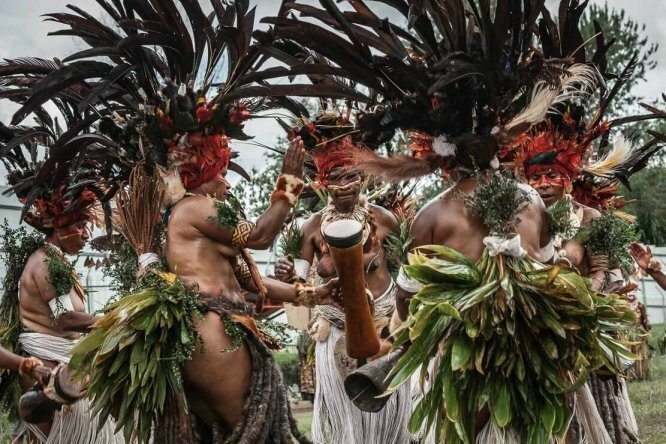 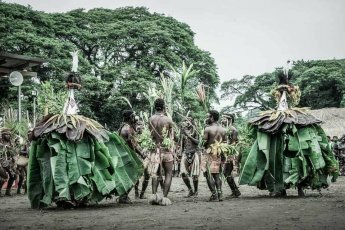 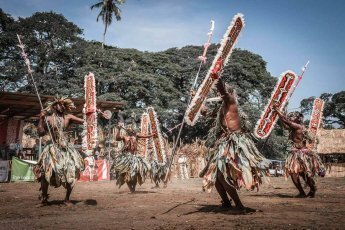 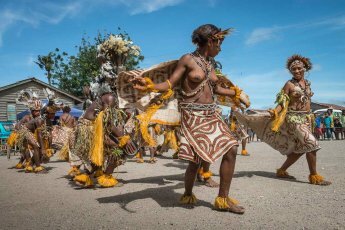 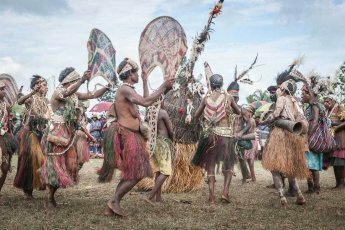 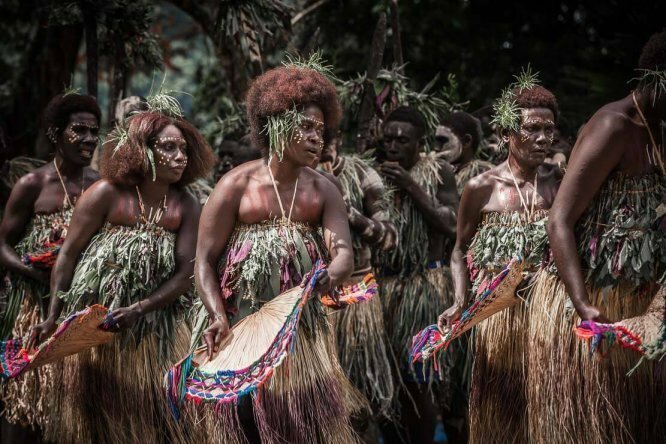 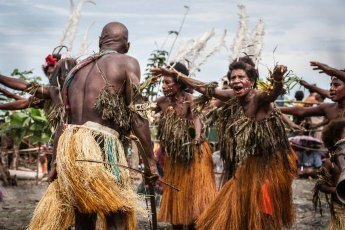 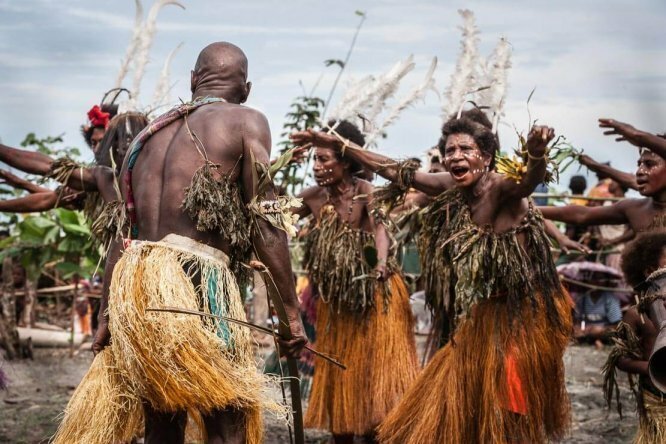 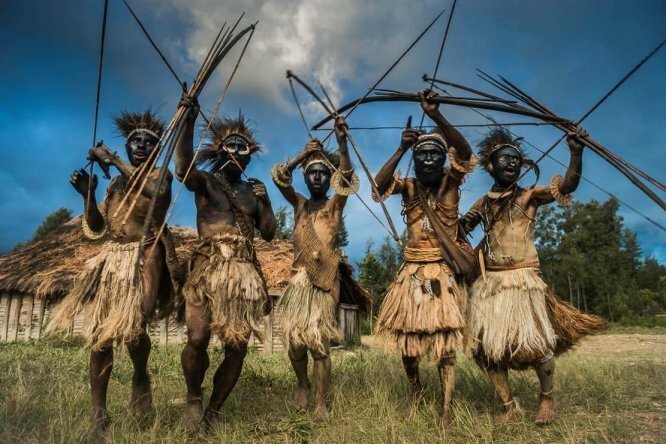 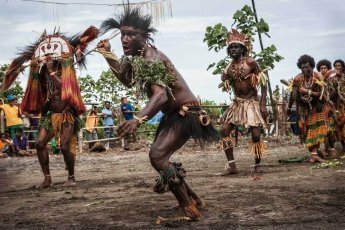 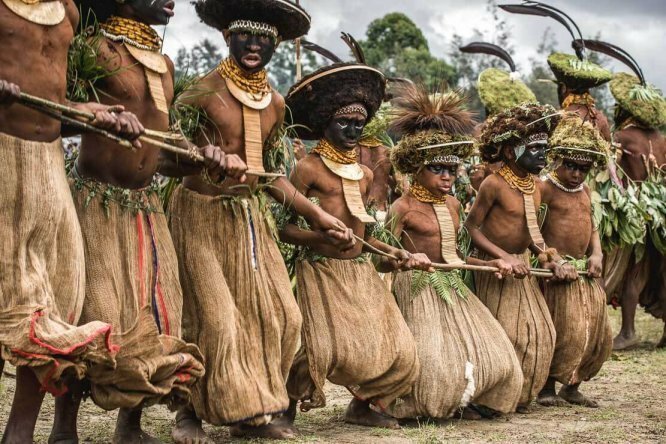 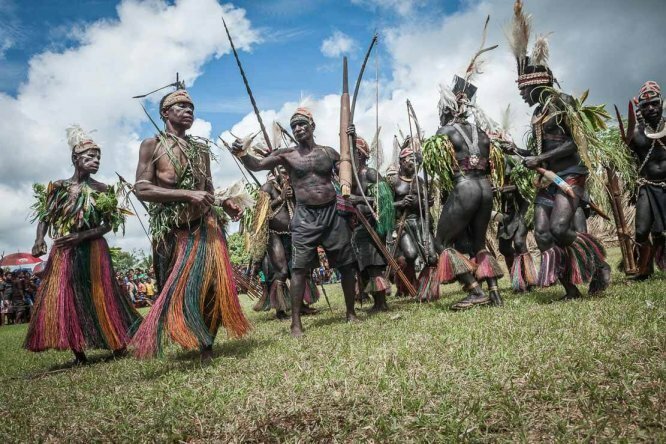 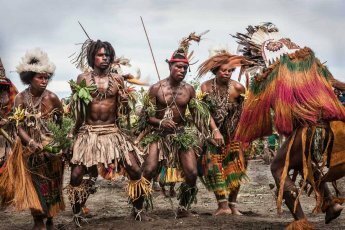 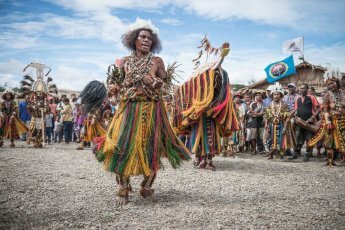 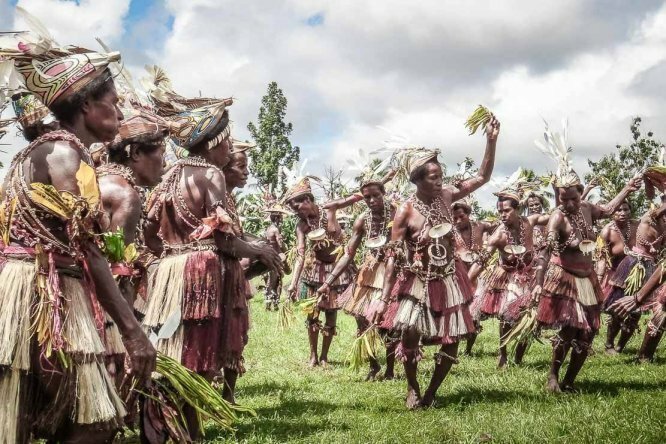 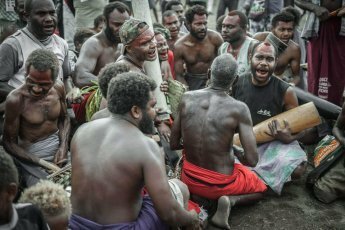 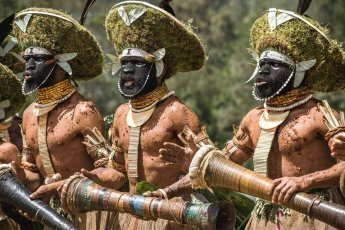 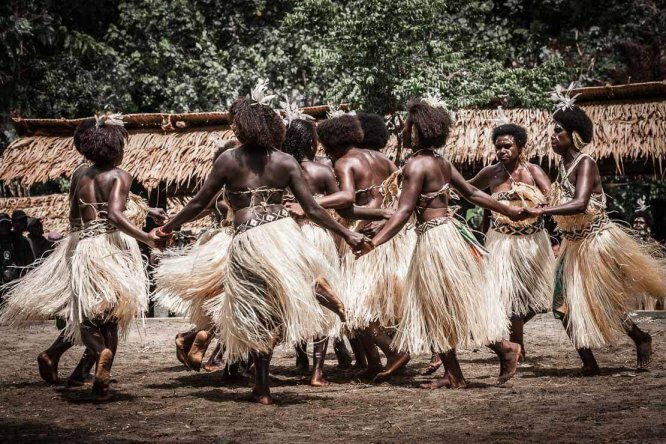 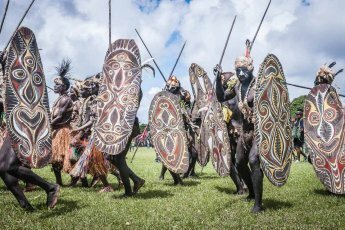 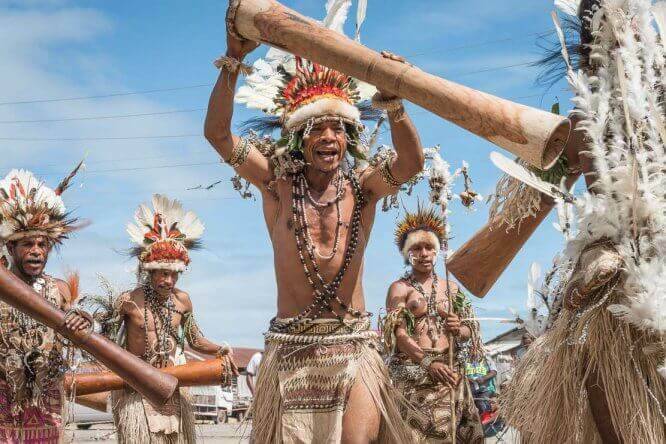 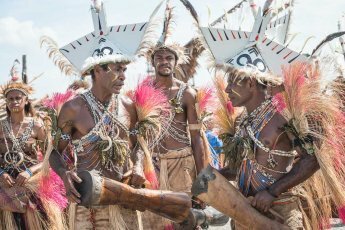 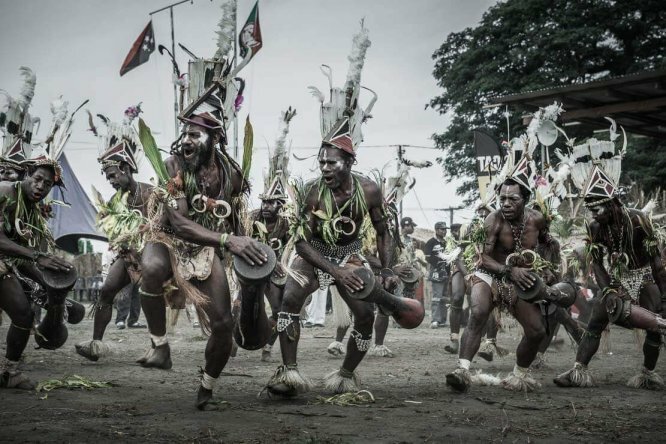 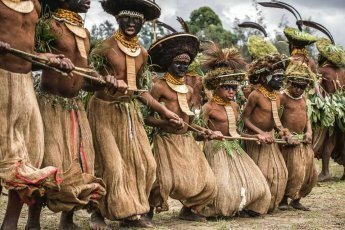 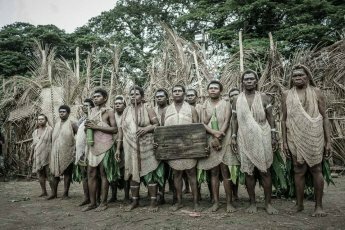 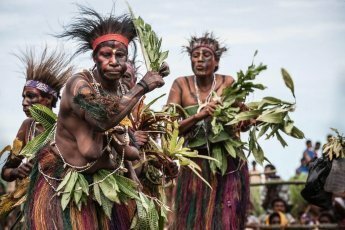 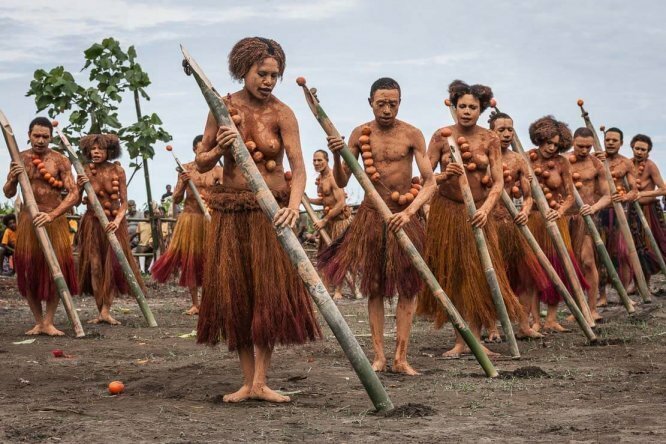 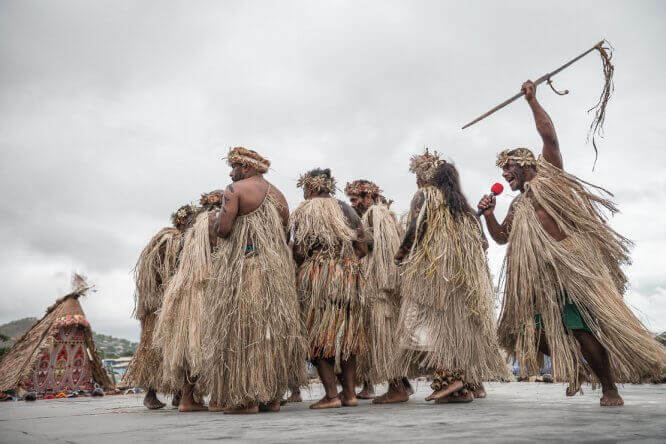 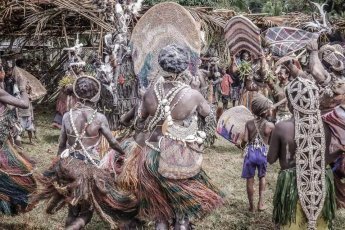 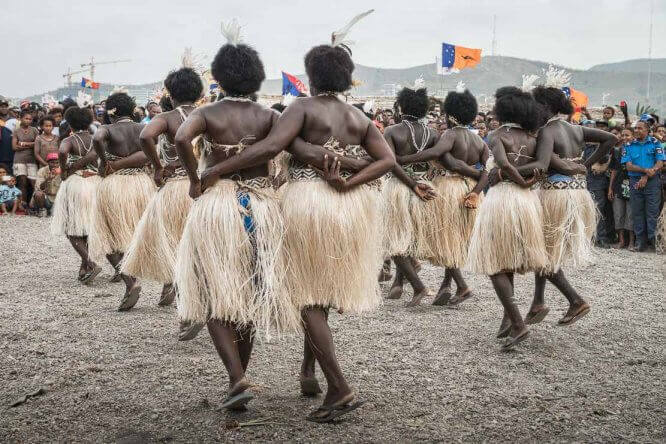 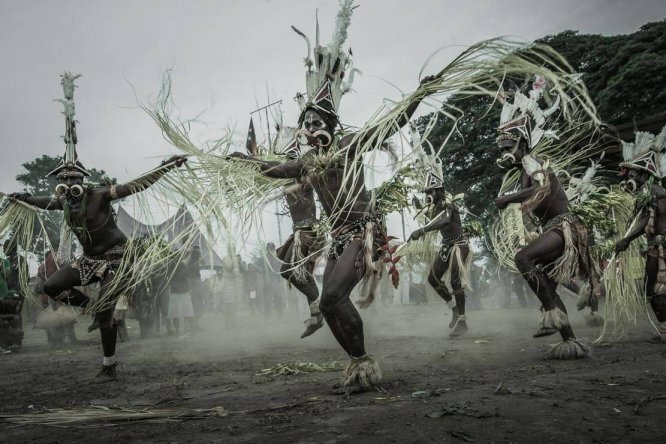 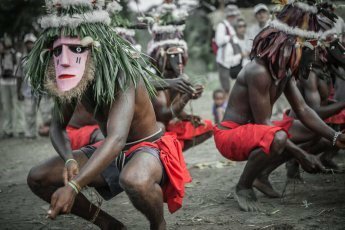 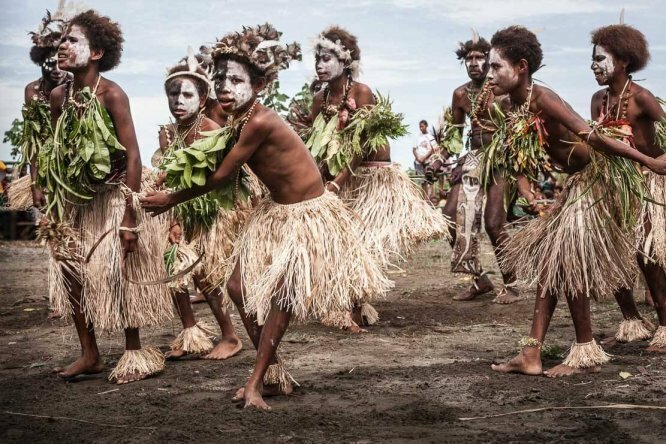 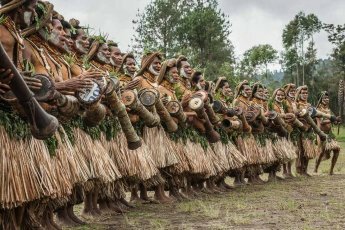 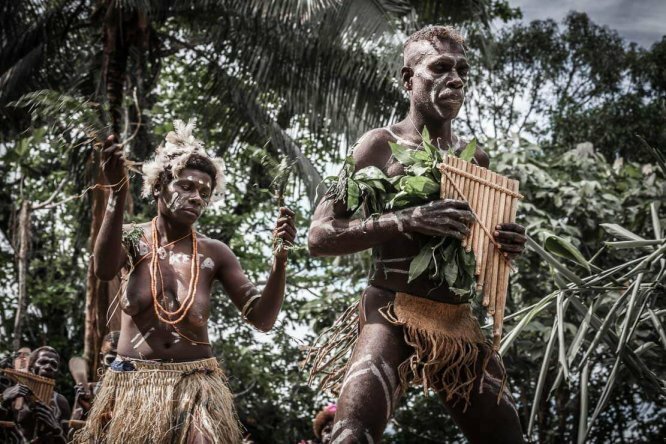 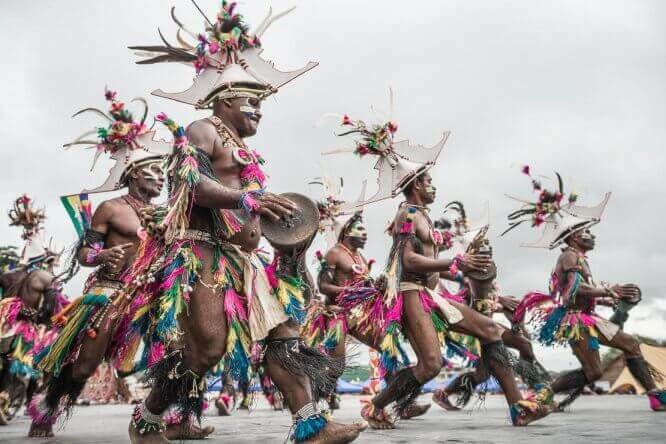 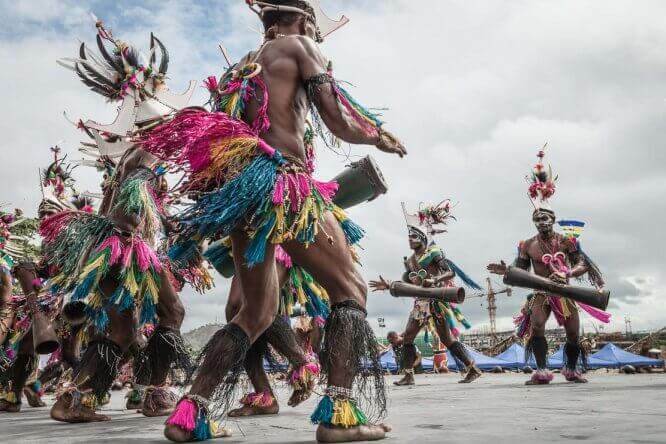 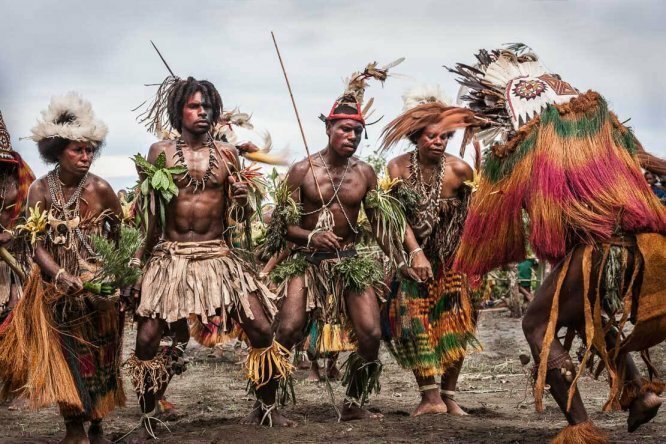 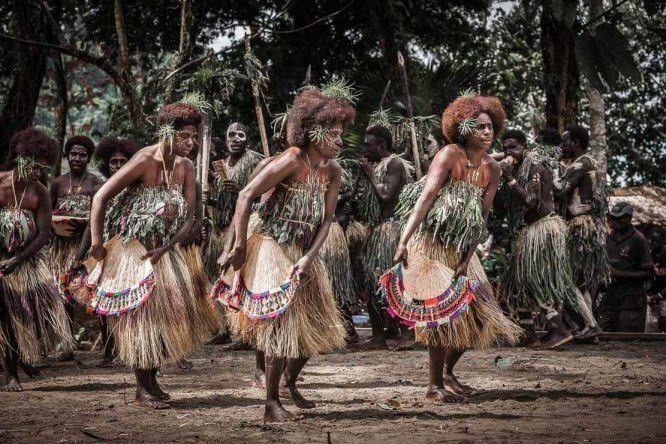 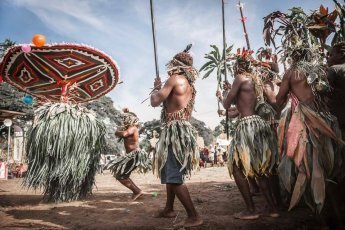 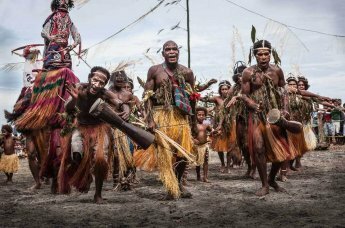 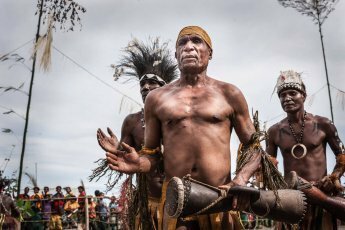 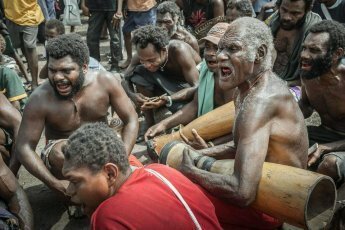 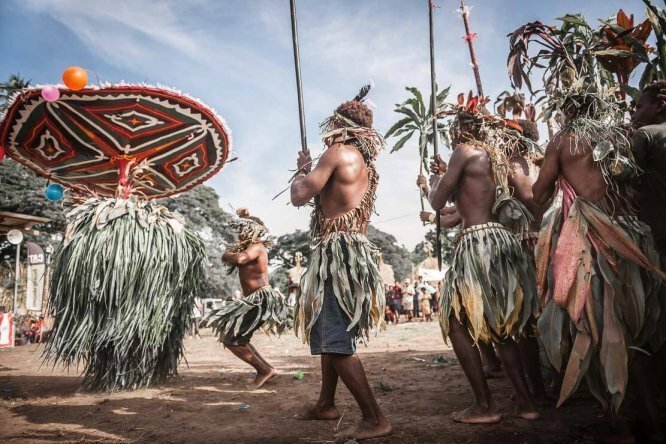 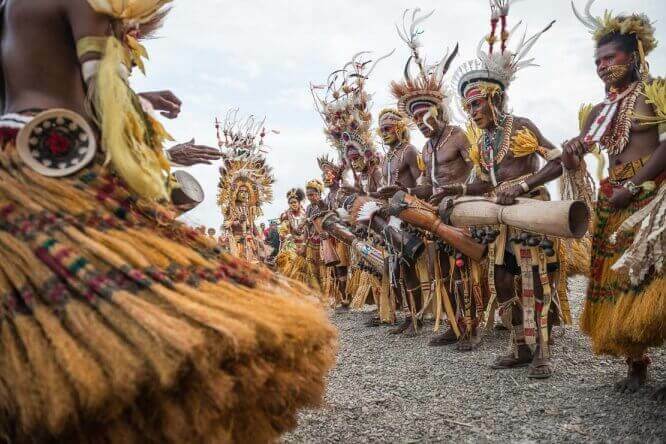 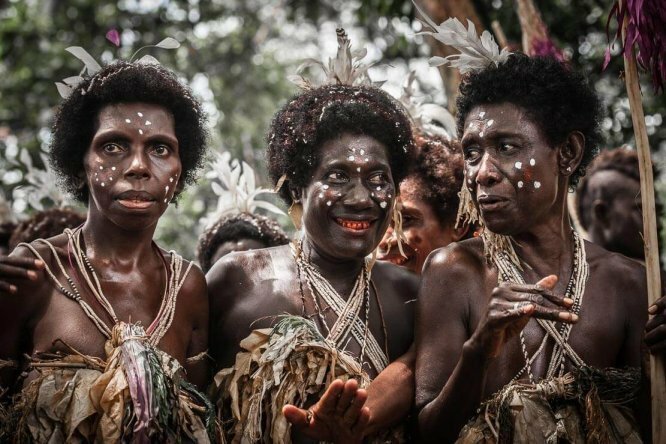 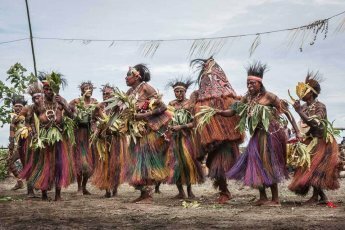 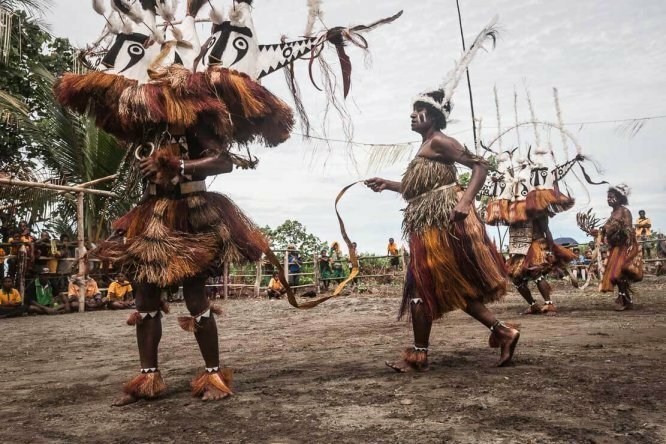 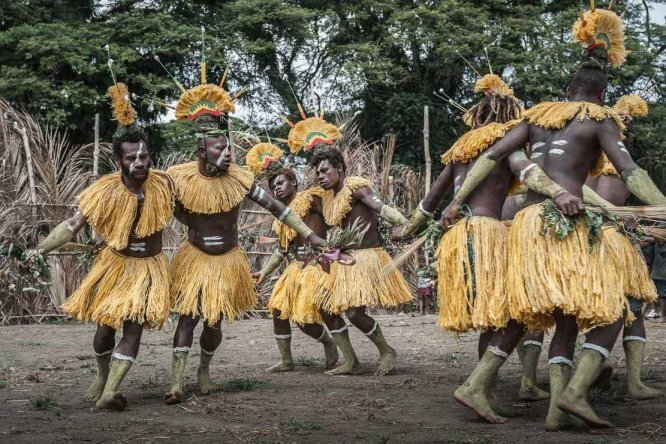 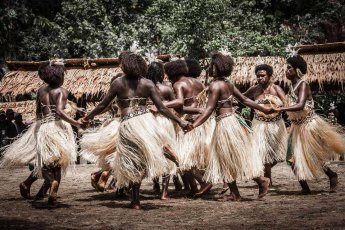 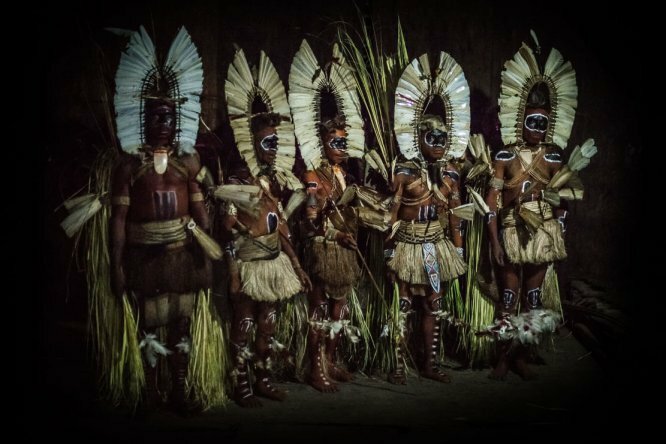 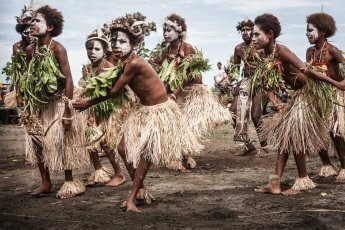 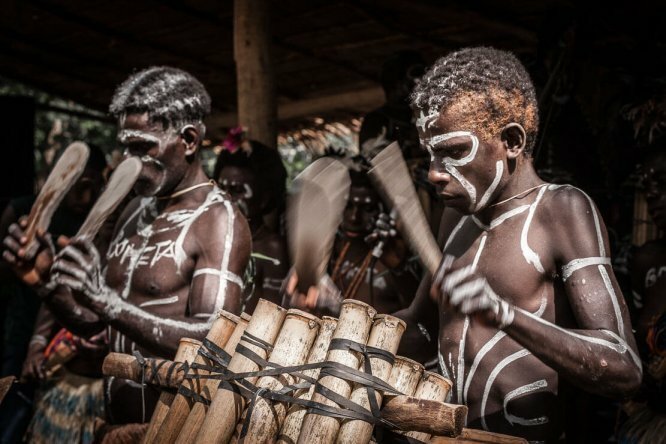 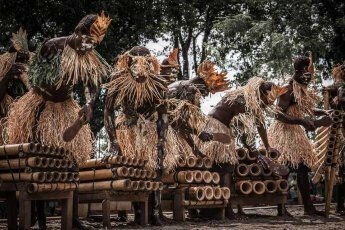 While dancing, the Engans sing "suli muli", which has become also the name of the Enga tribe. 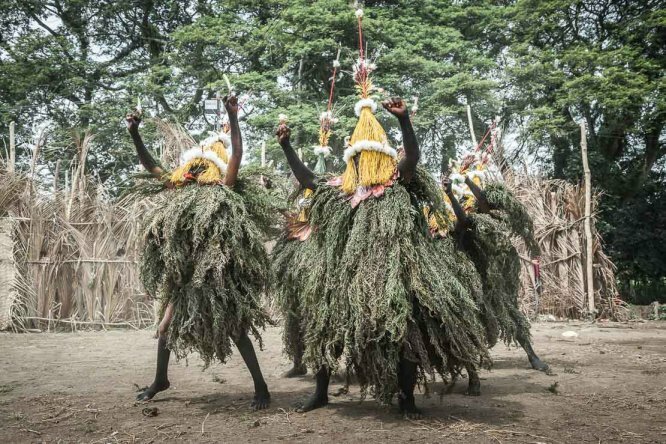 Suli Muli women wear giant hats made of moss and plant fibres. 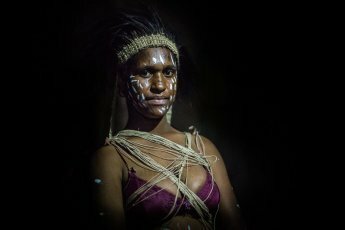 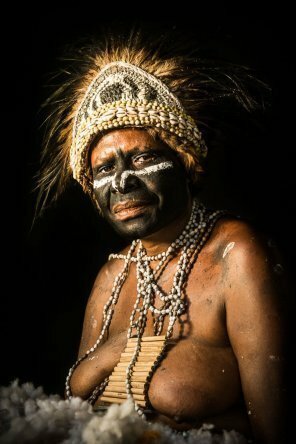 Woman from Laipan women sing sing group from Laiagam, Enga Province of Papua New Guinea. 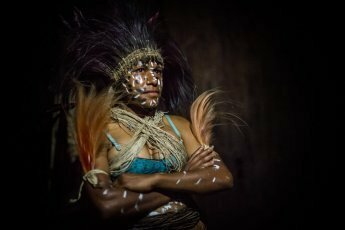 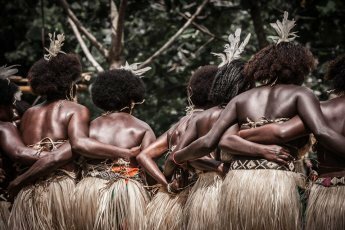 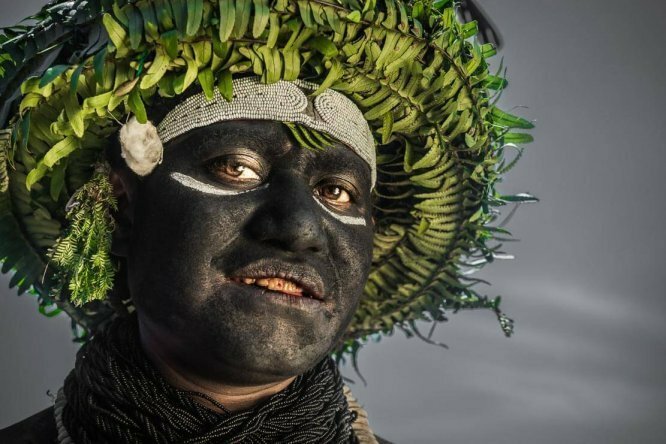 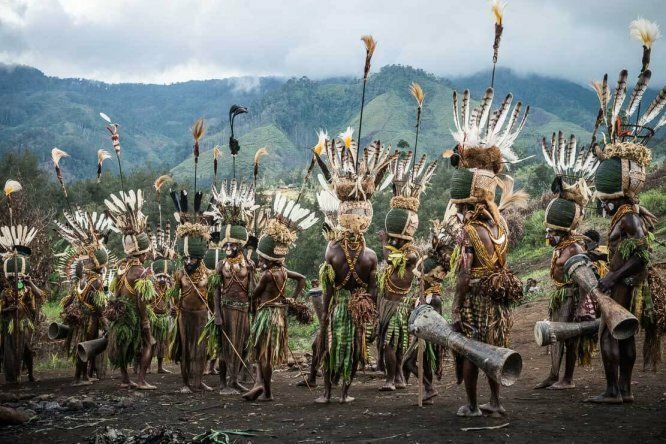 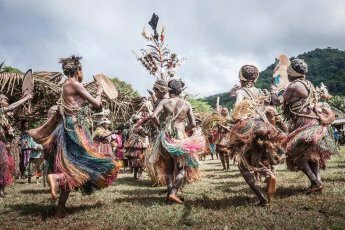 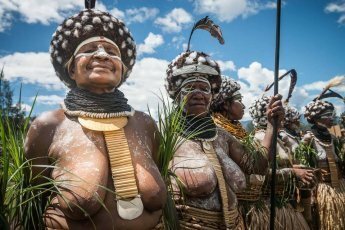 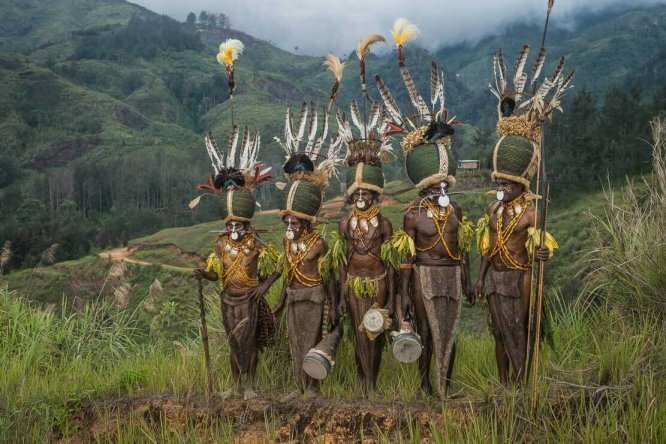 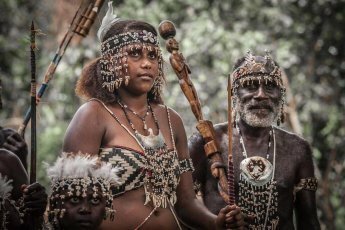 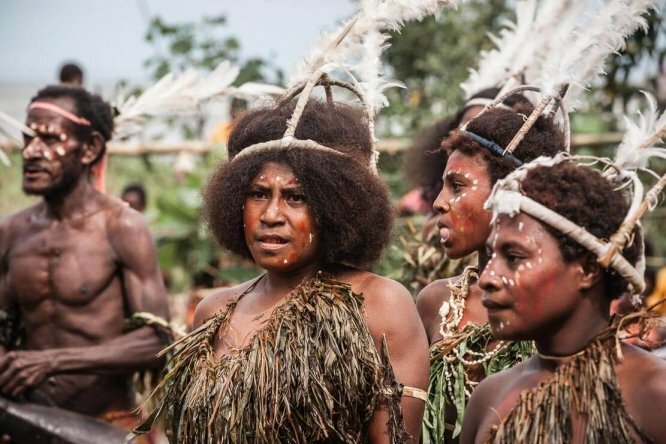 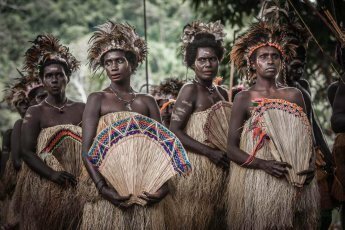 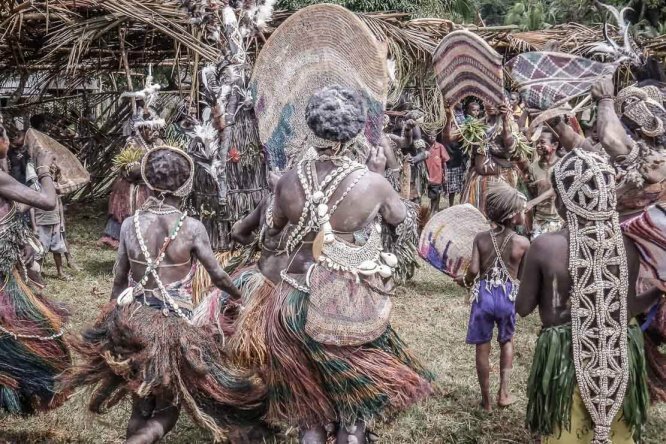 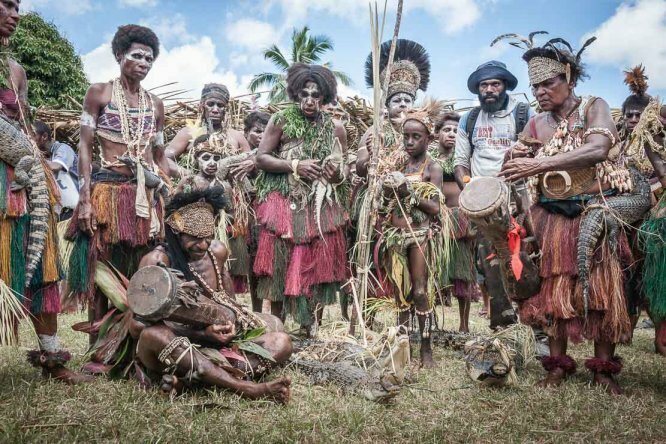 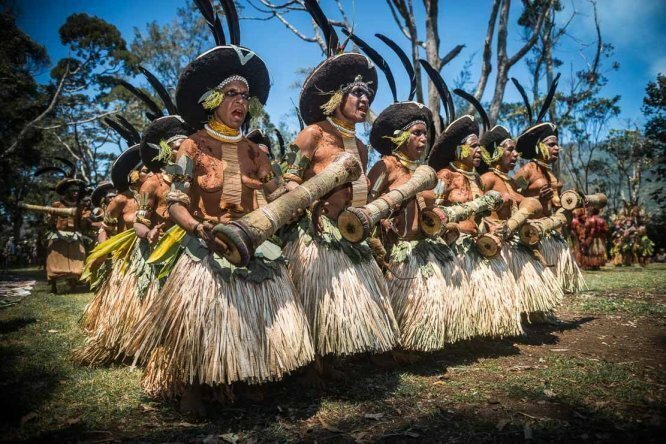 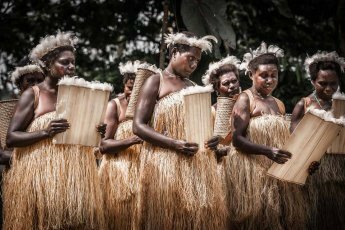 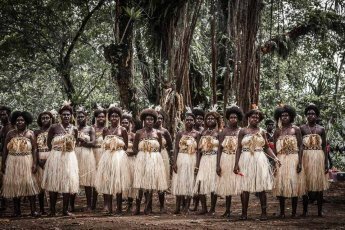 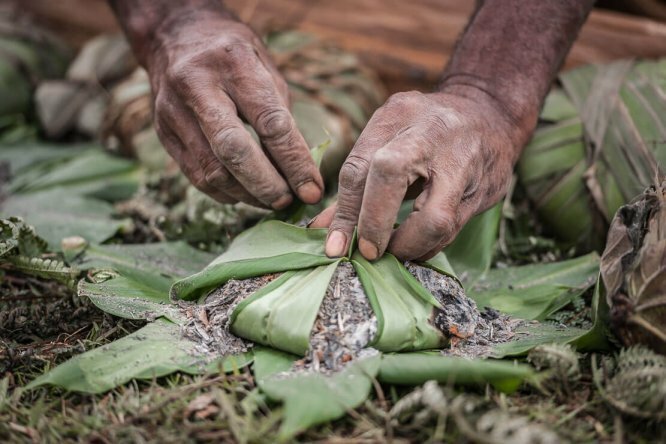 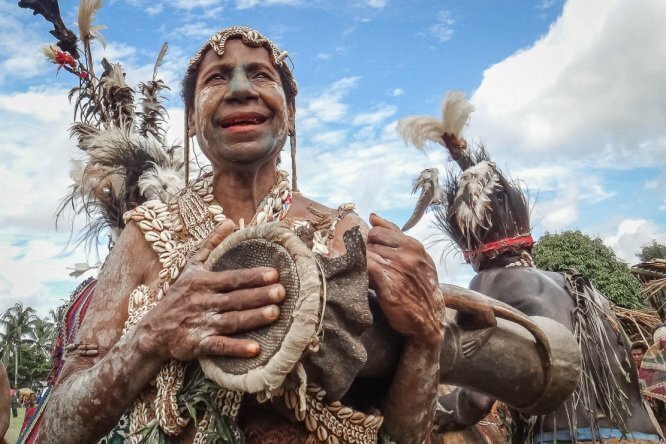 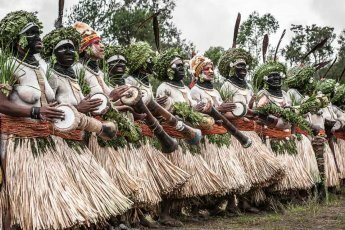 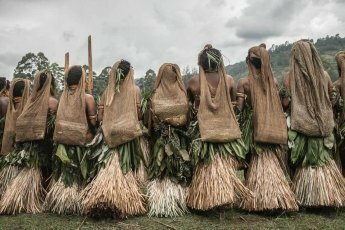 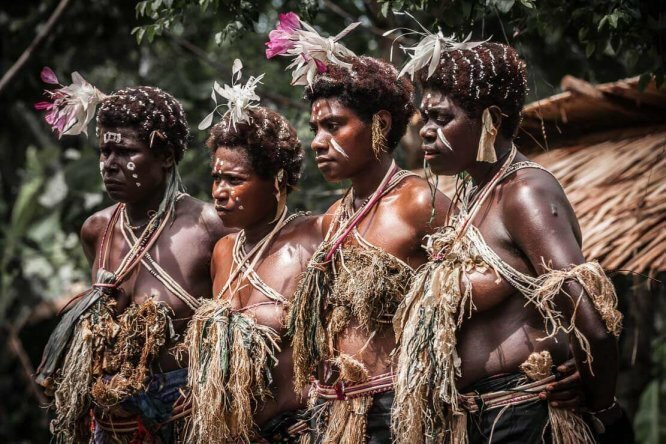 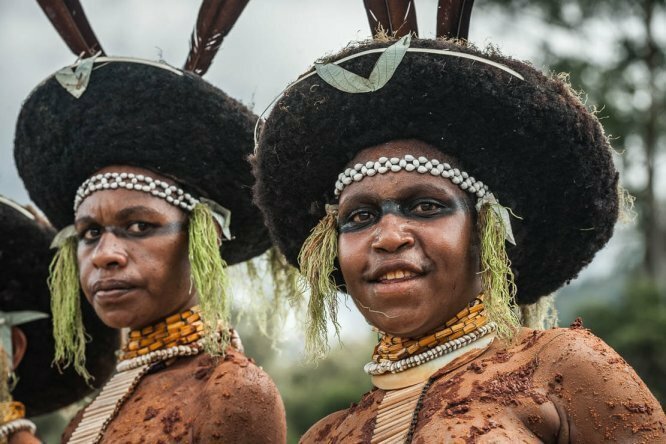 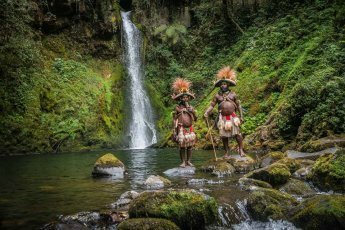 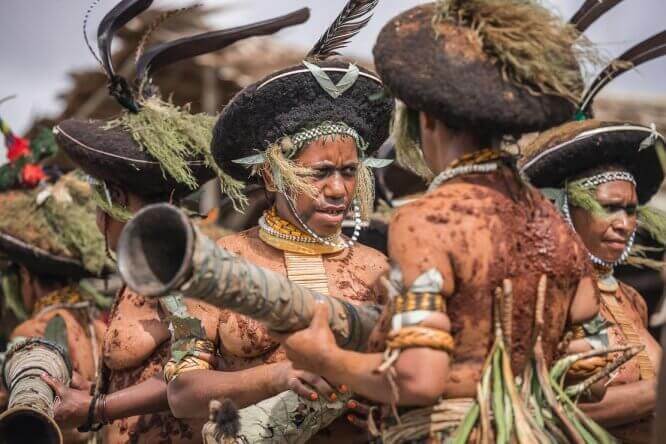 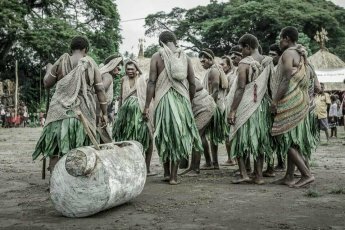 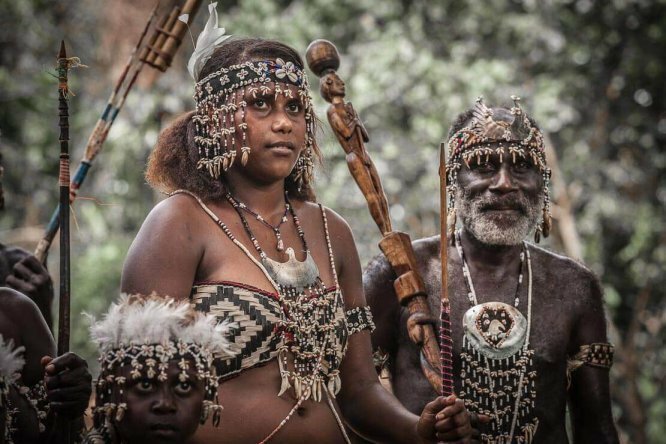 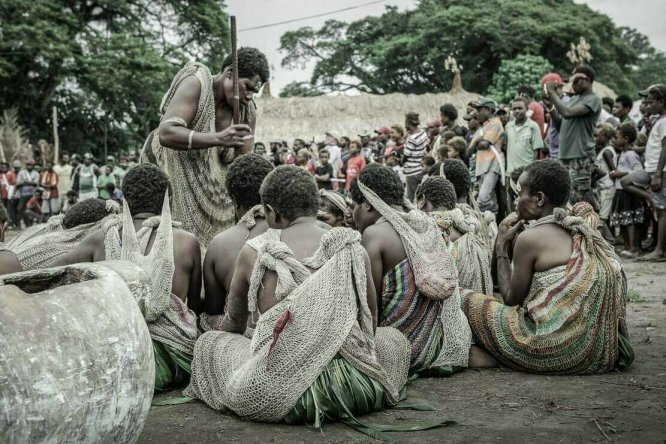 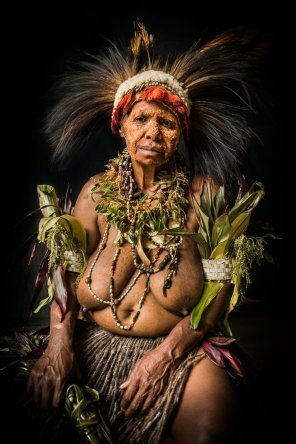 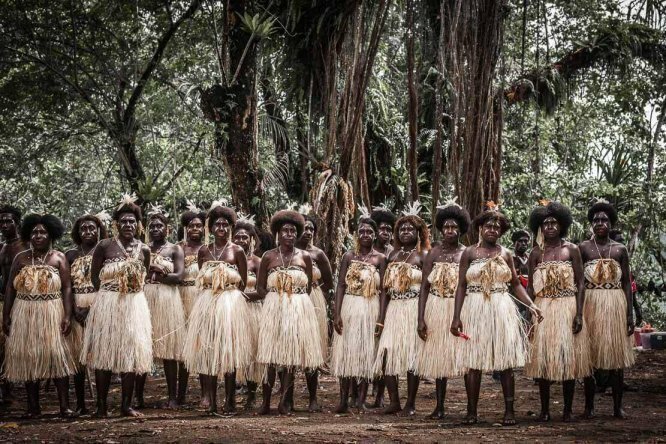 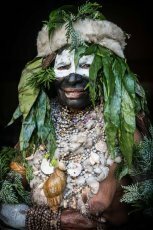 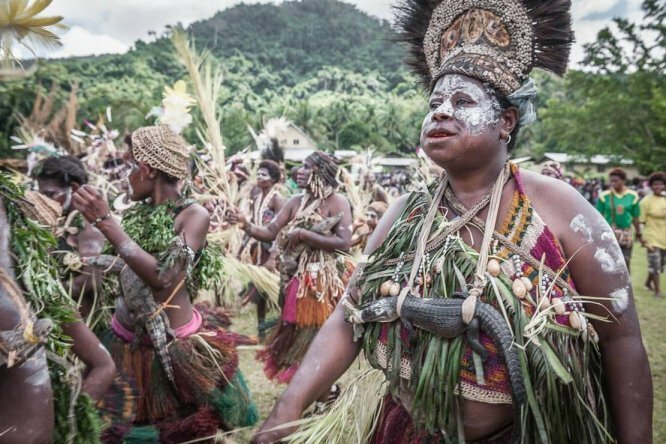 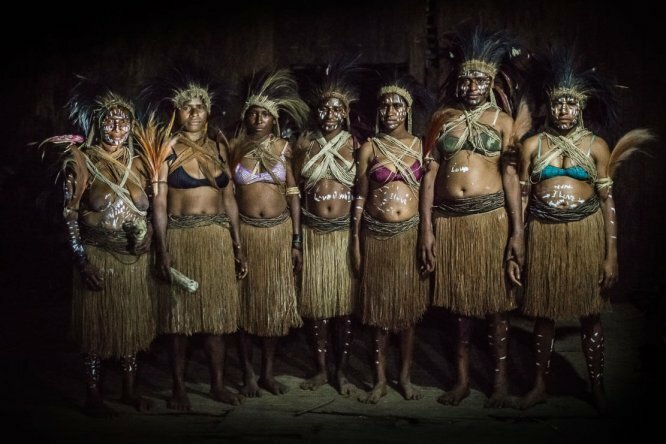 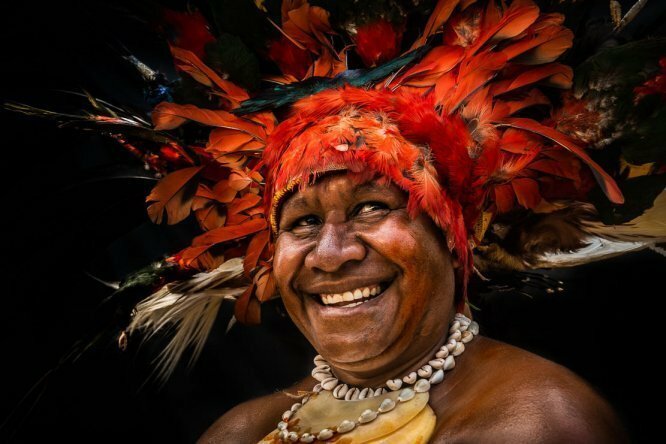 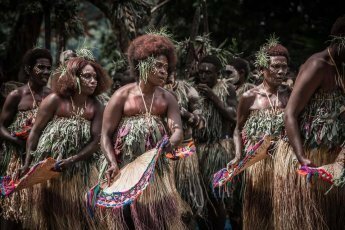 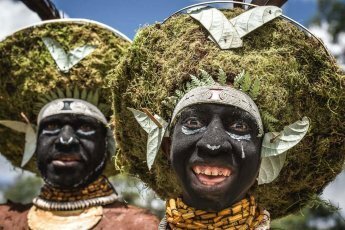 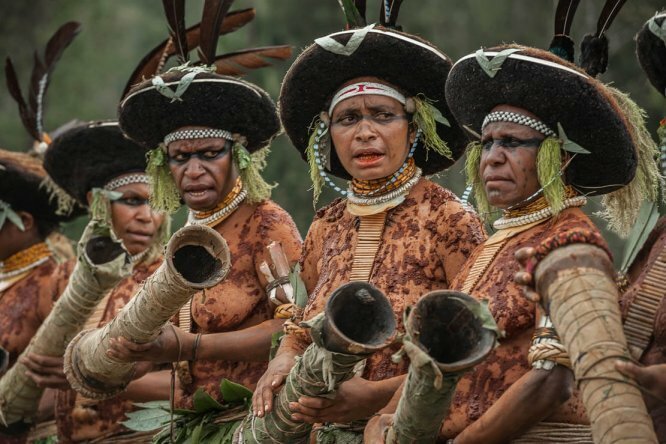 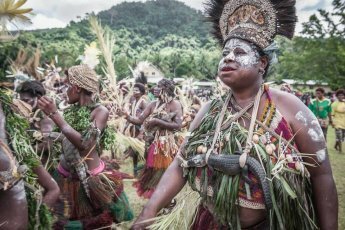 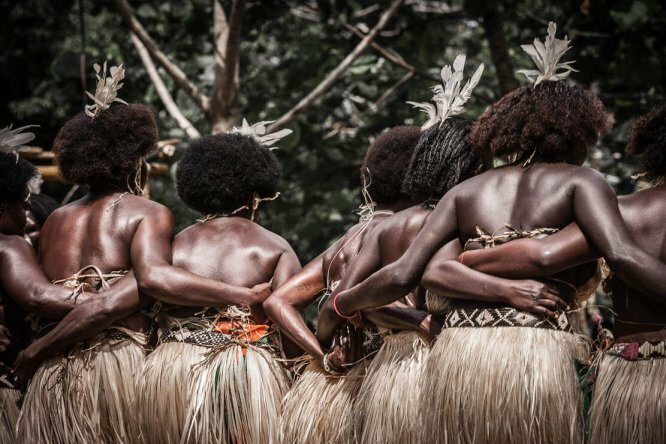 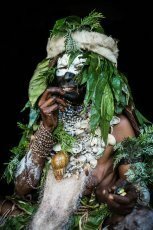 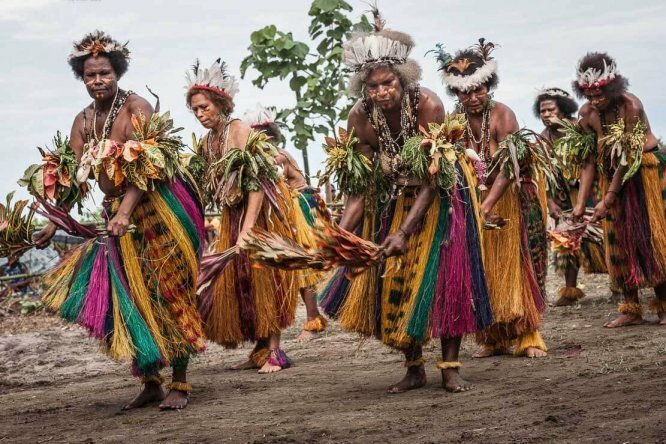 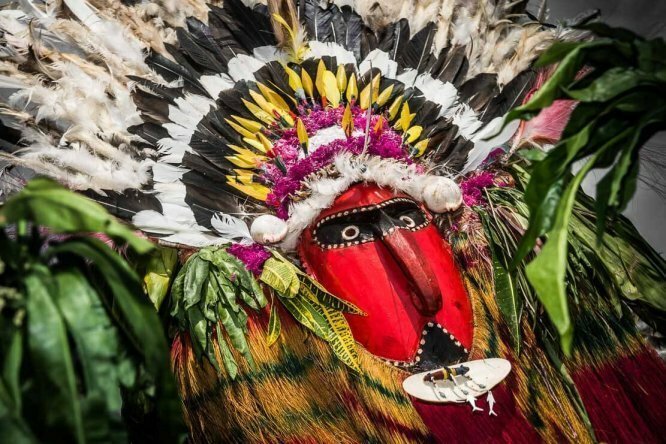 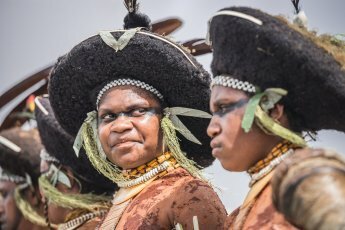 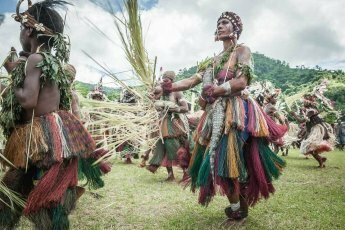 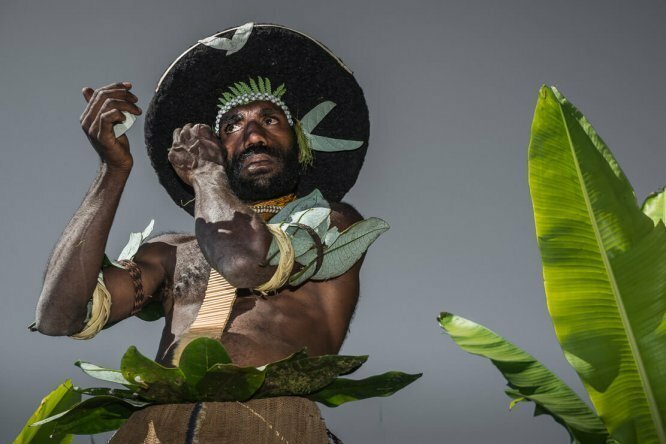 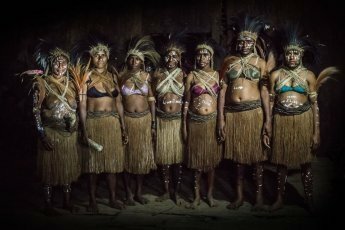 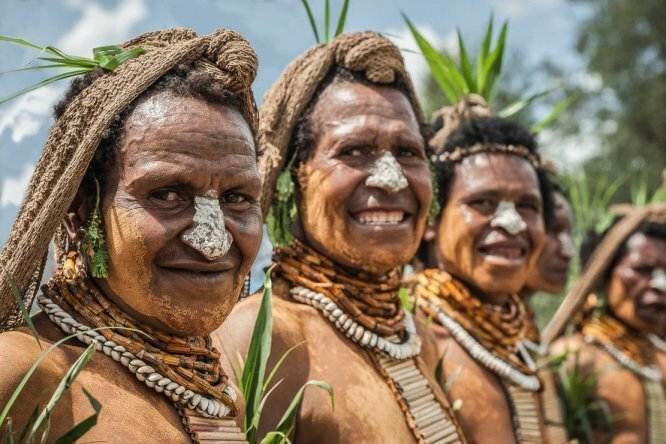 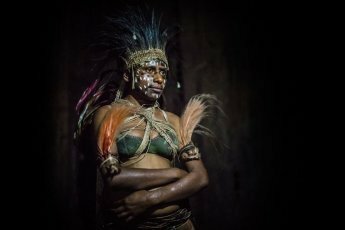 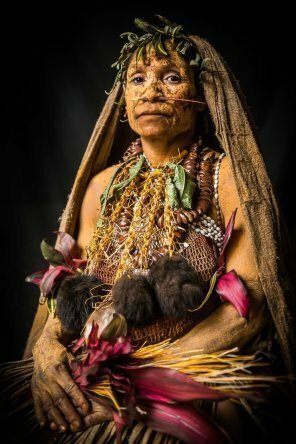 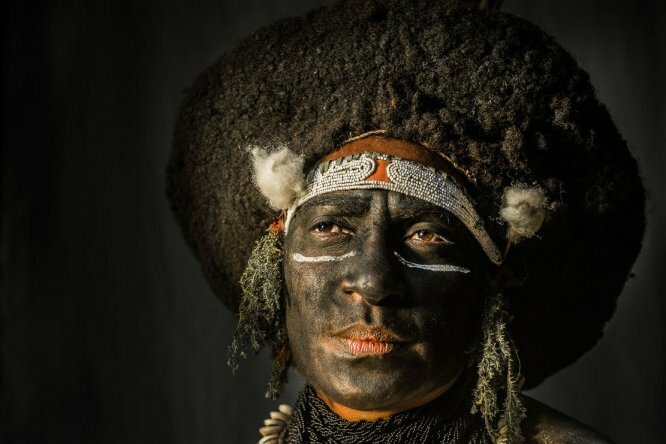 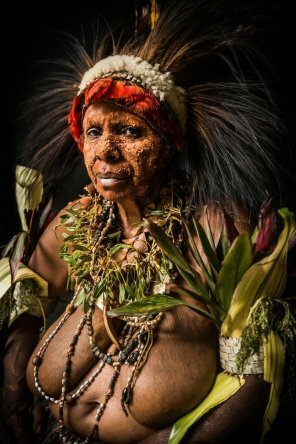 The Engan women, also known as Suli Muli, wear giant hats made of moss and plant fibres. 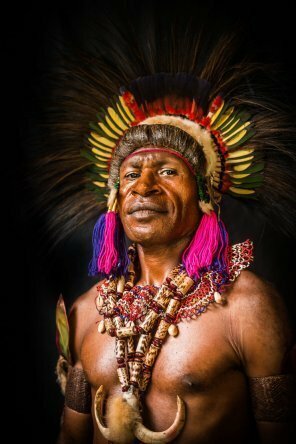 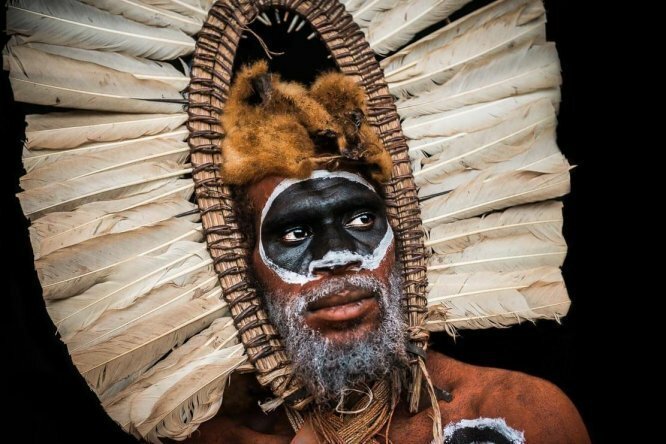 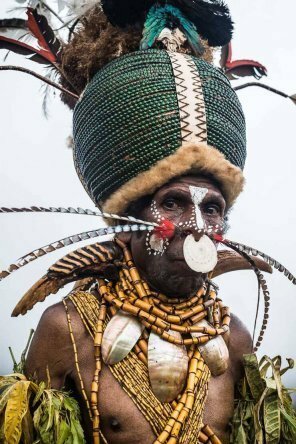 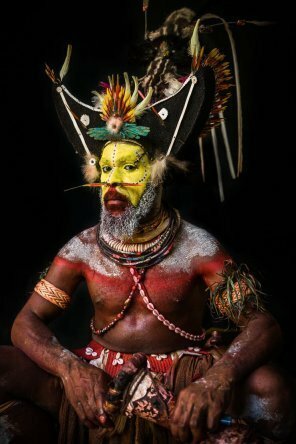 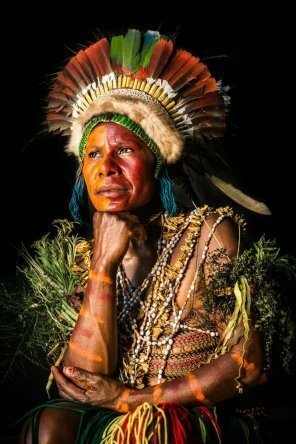 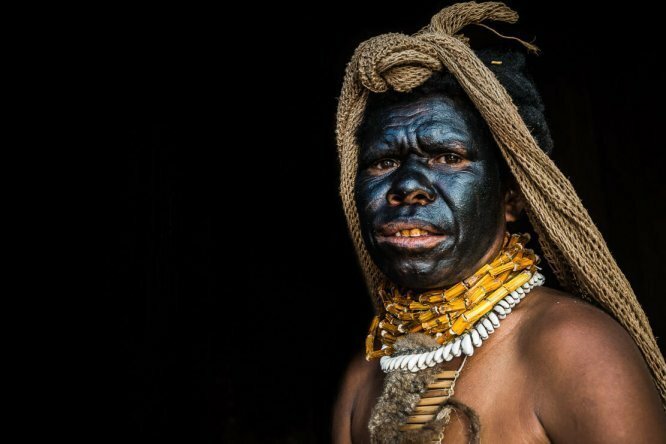 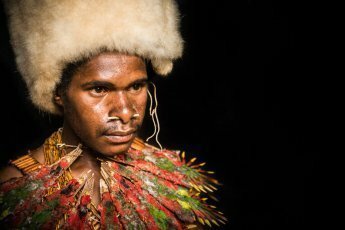 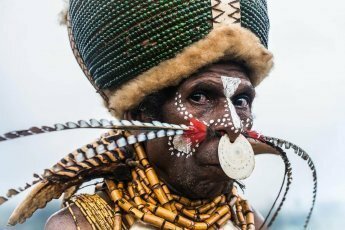 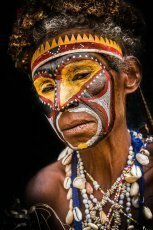 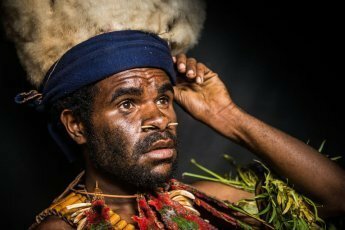 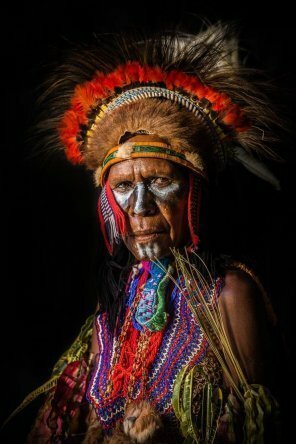 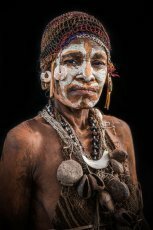 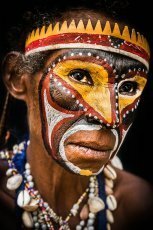 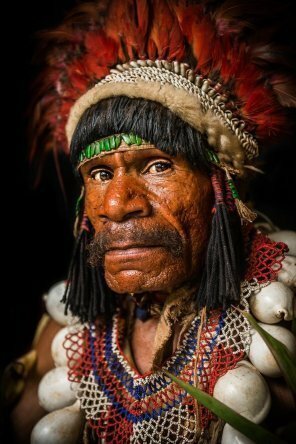 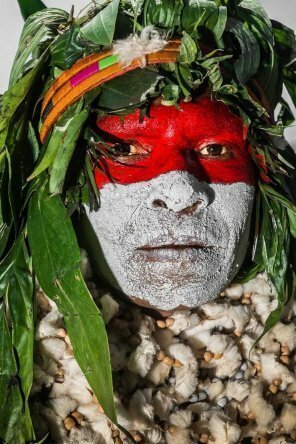 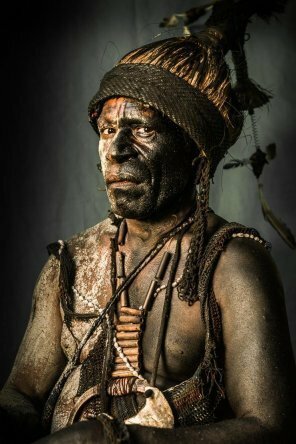 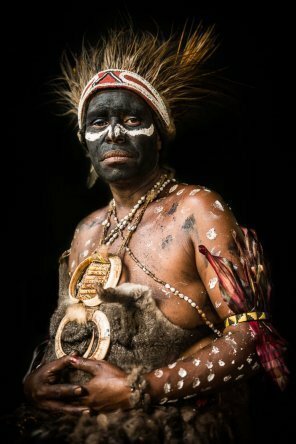 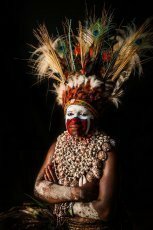 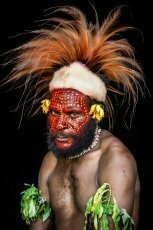 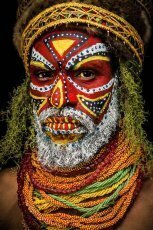 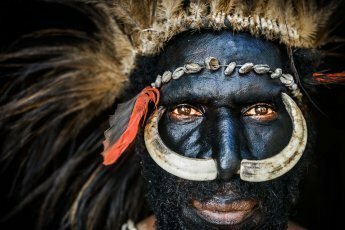 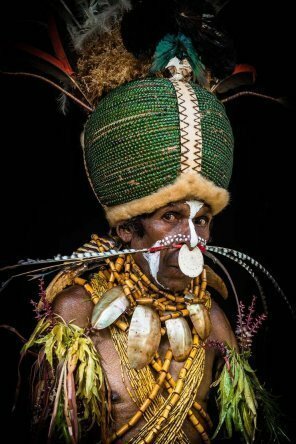 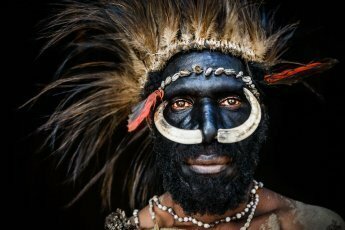 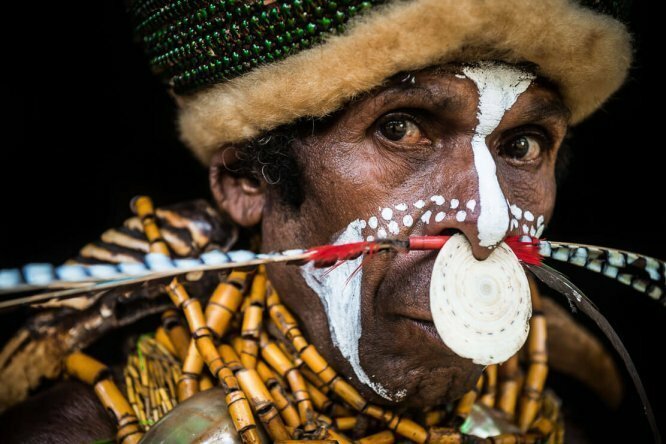 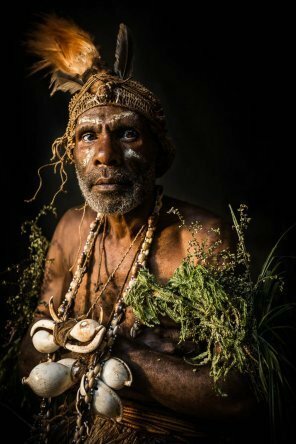 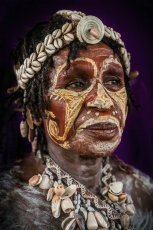 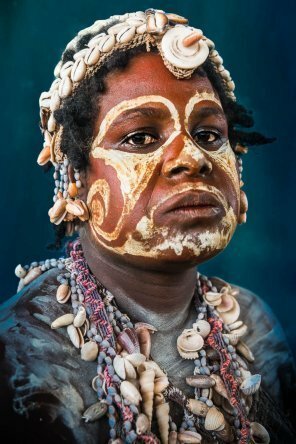 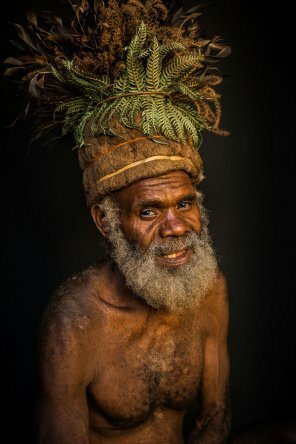 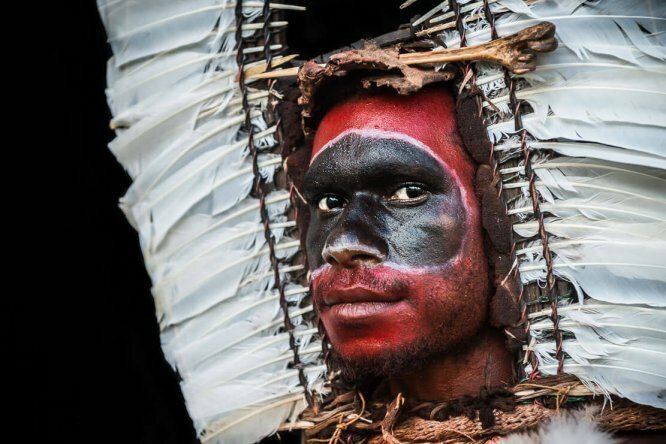 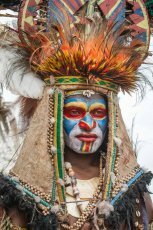 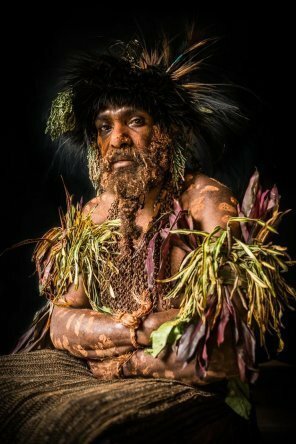 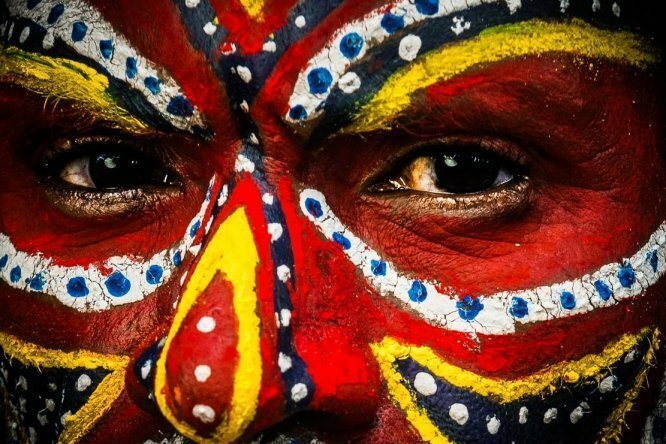 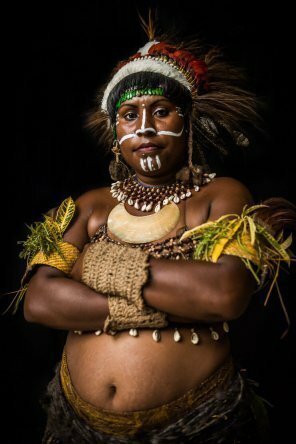 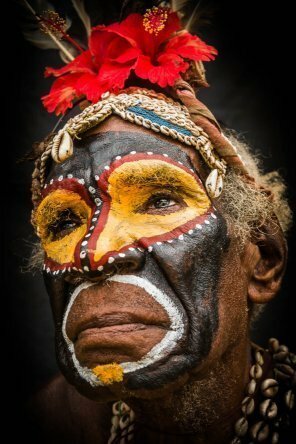 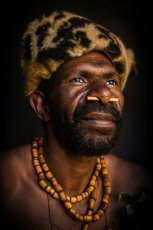 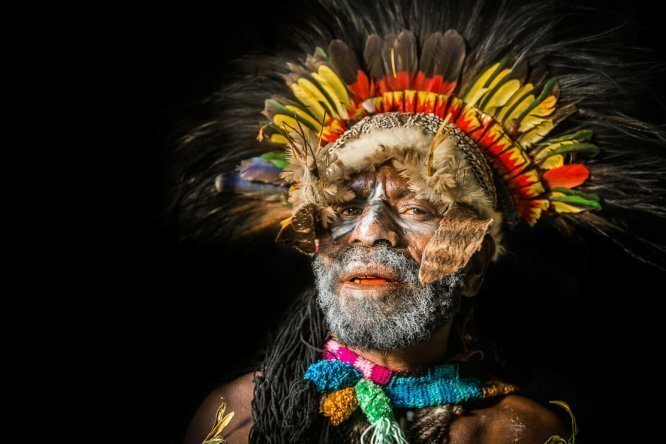 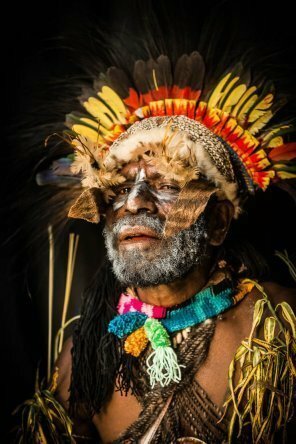 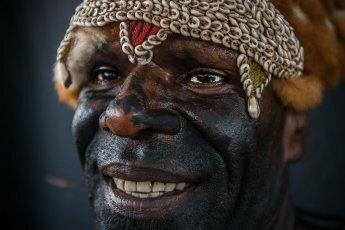 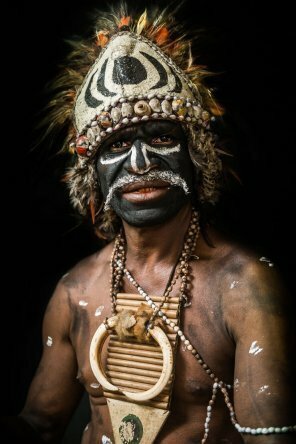 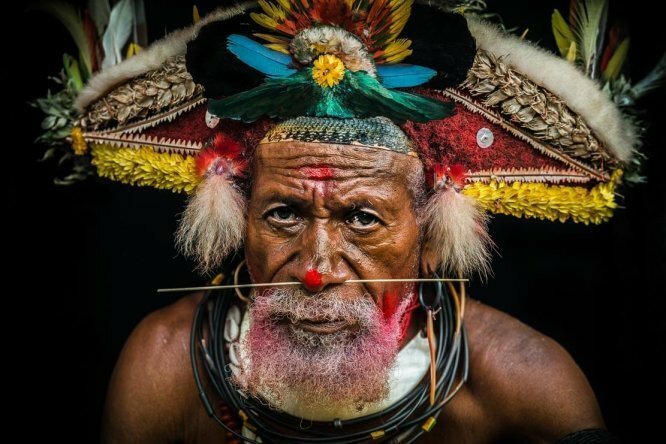 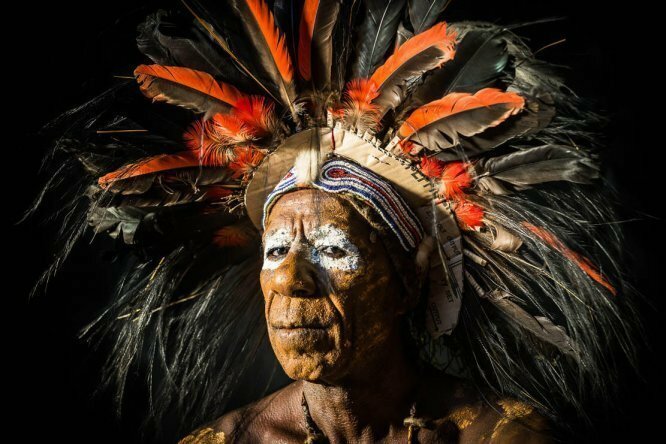 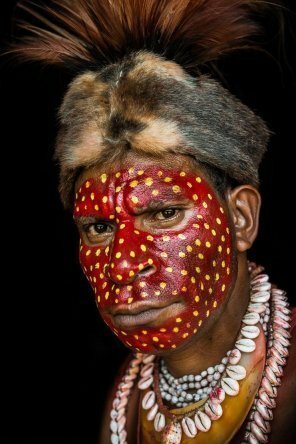 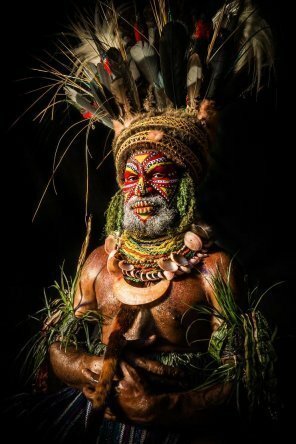 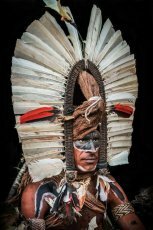 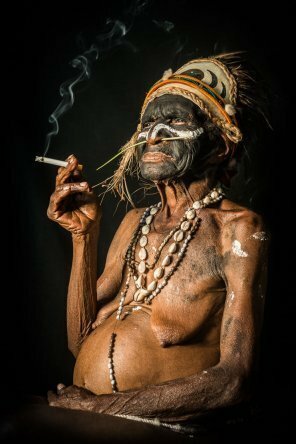 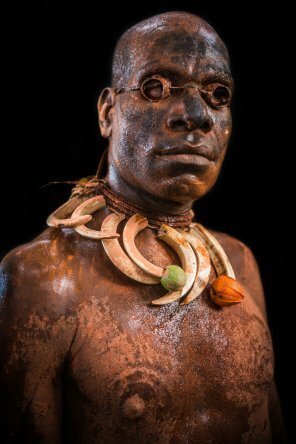 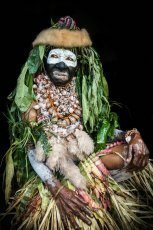 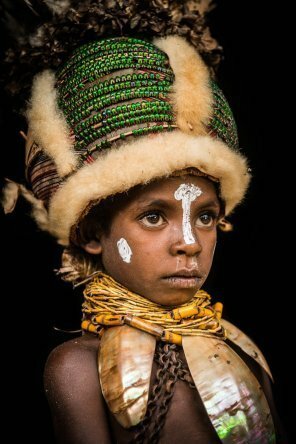 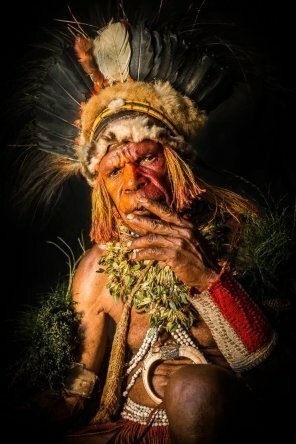 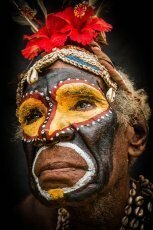 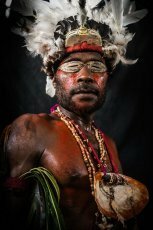 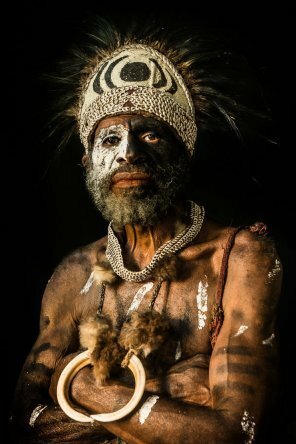 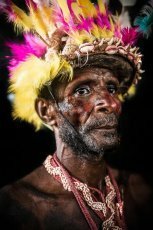 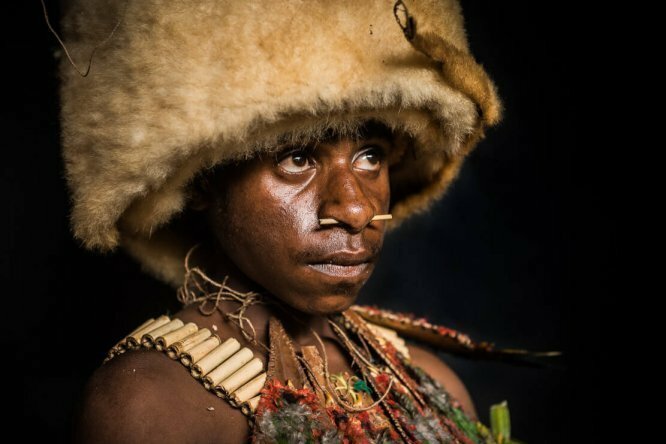 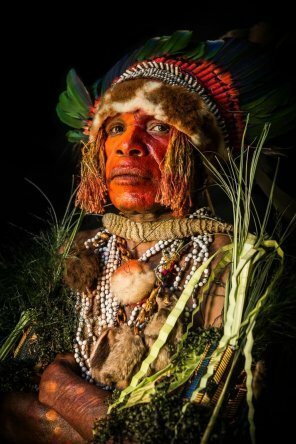 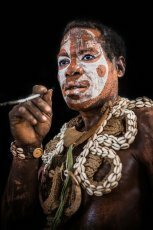 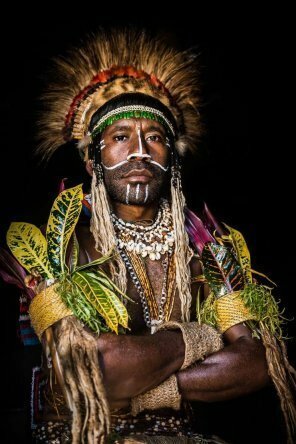 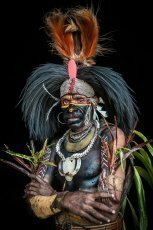 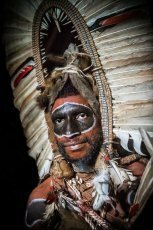 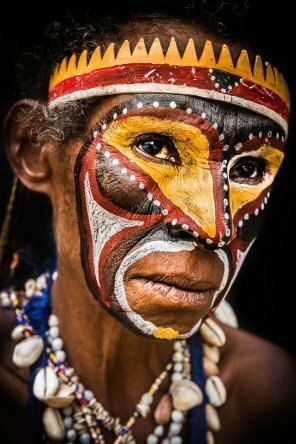 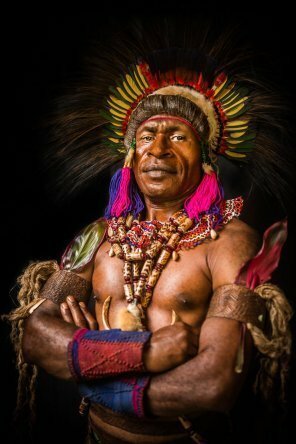 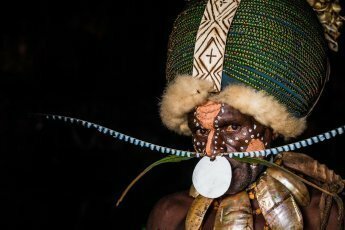 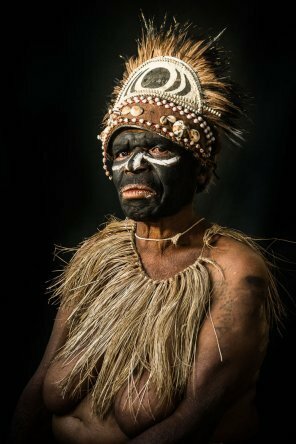 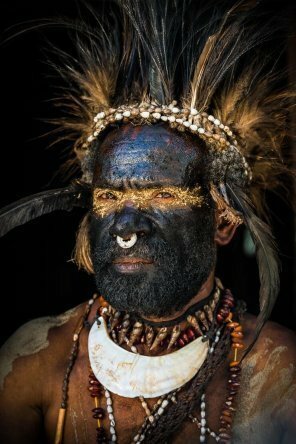 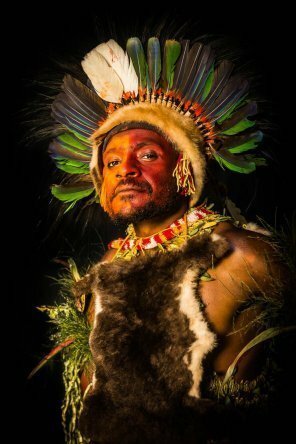 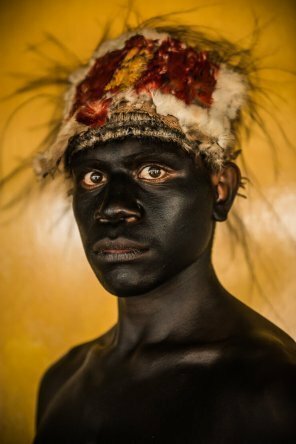 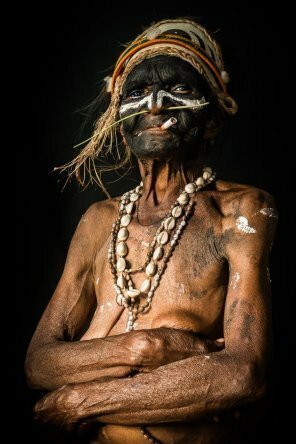 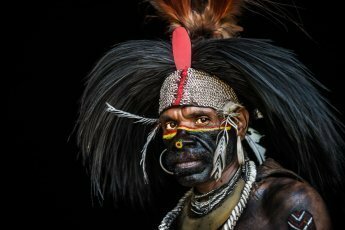 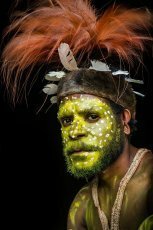 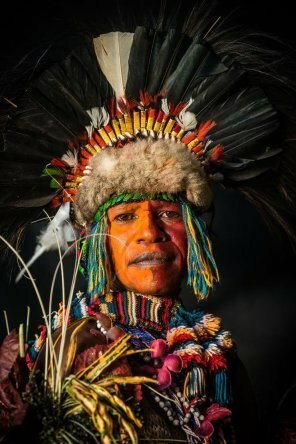 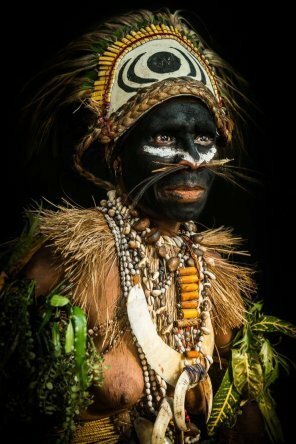 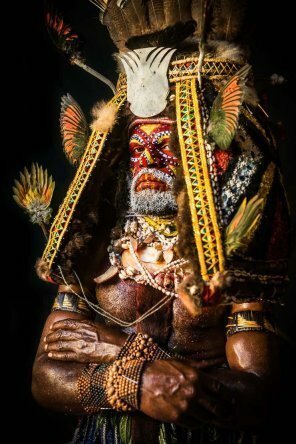 Tribesman from Enga Province of Papua New Guinea. 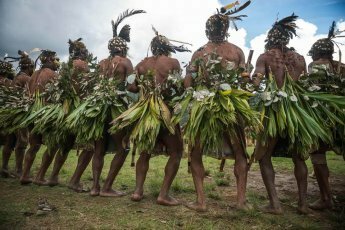 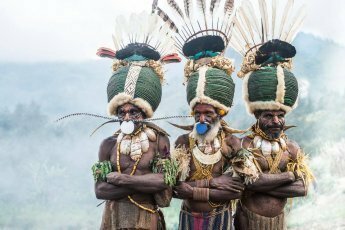 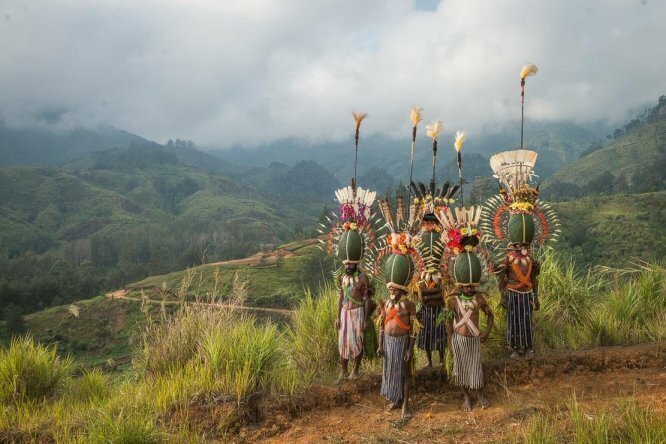 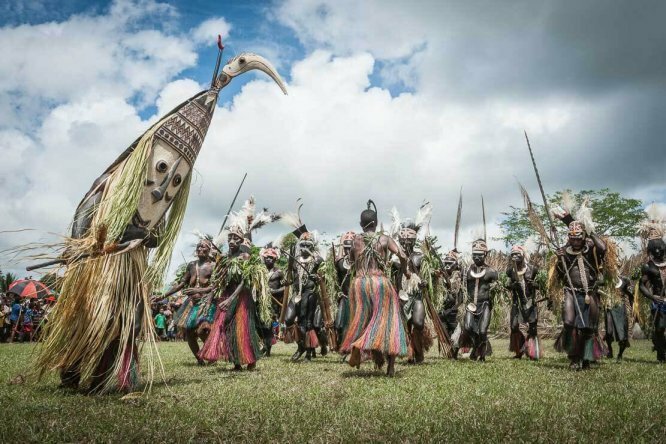 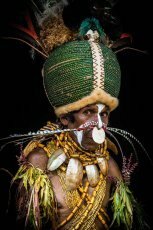 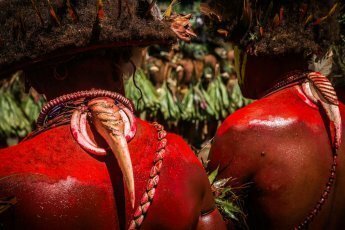 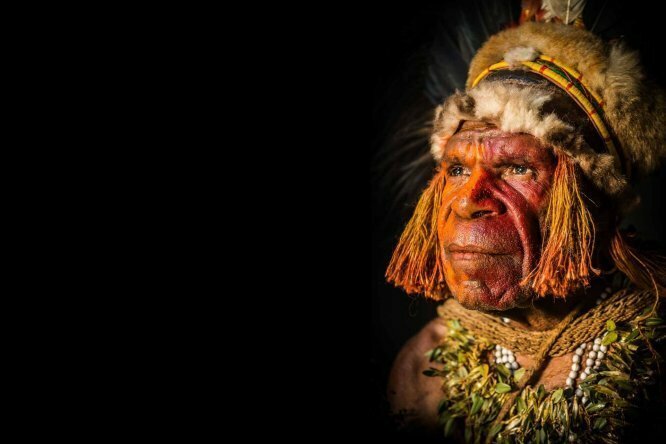 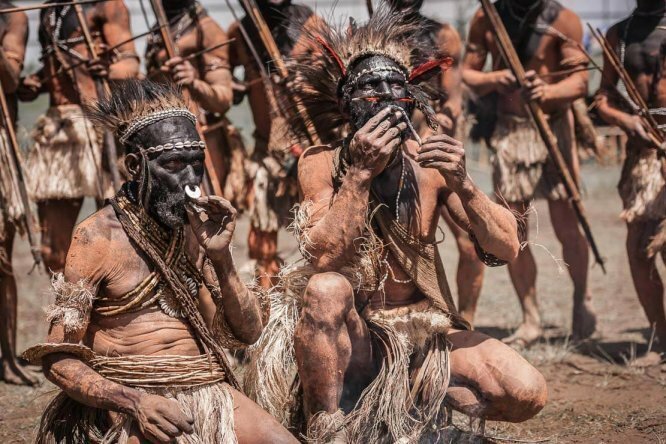 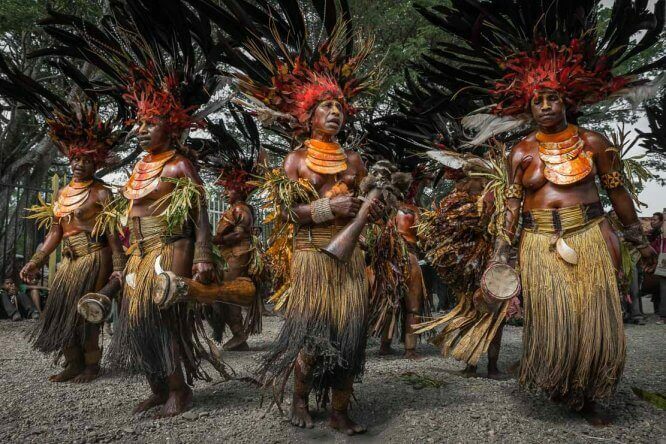 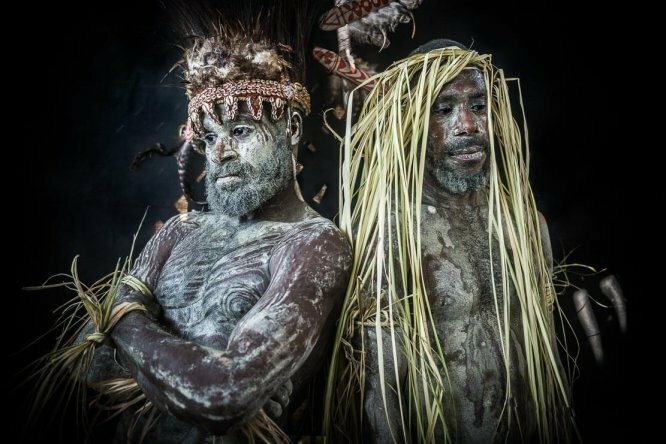 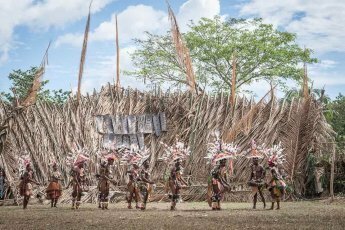 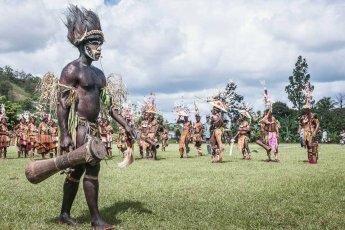 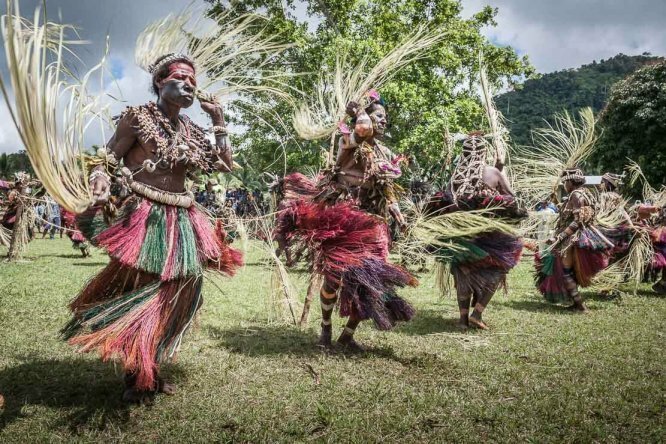 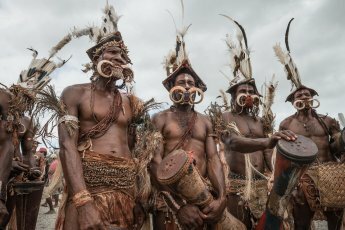 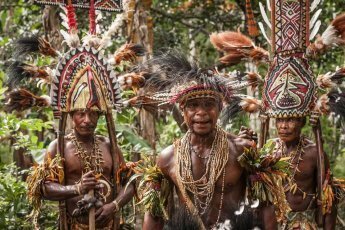 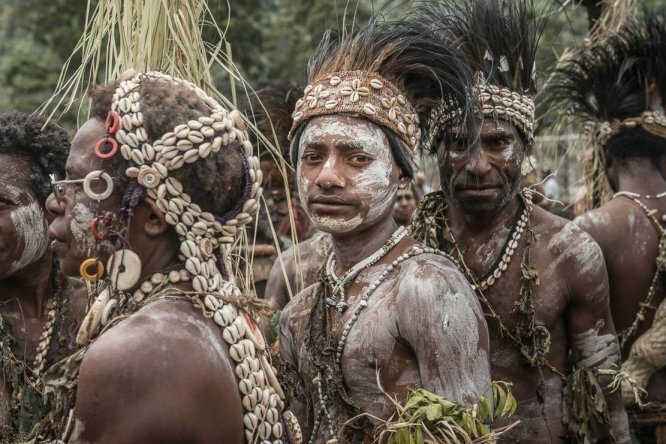 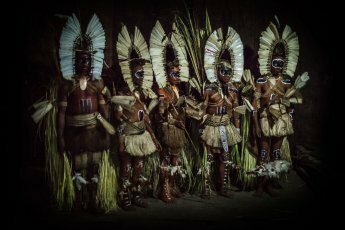 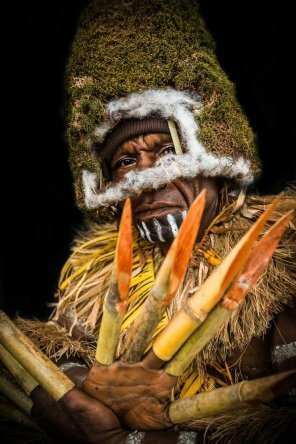 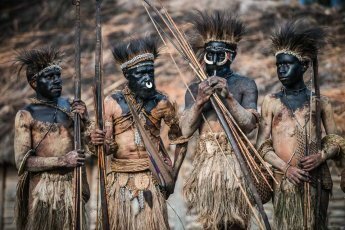 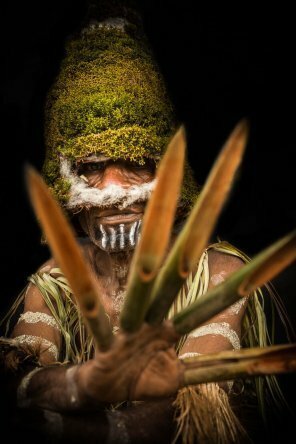 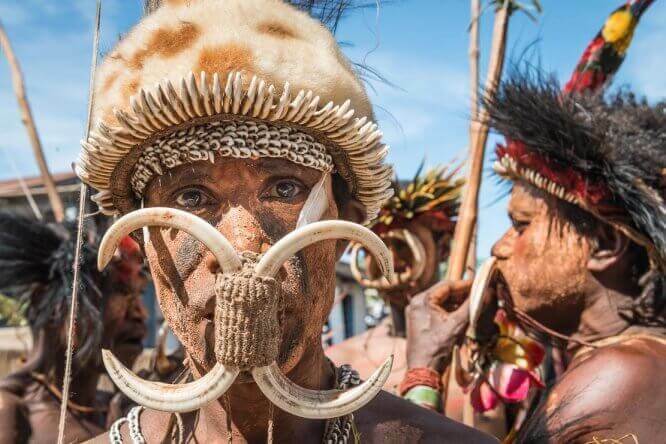 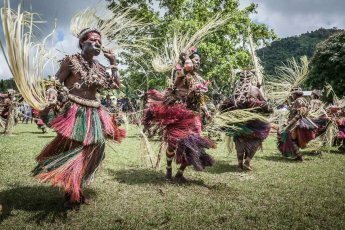 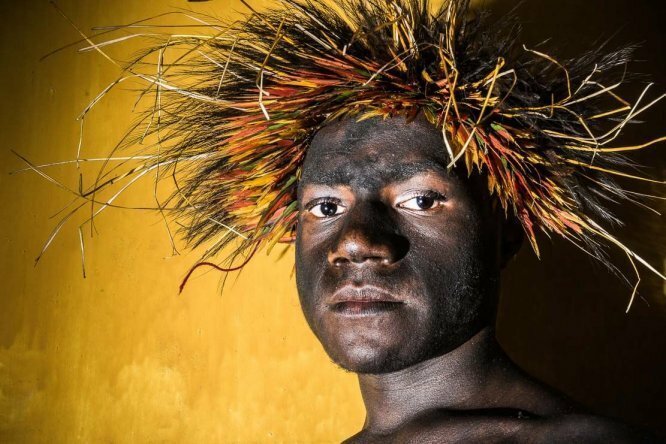 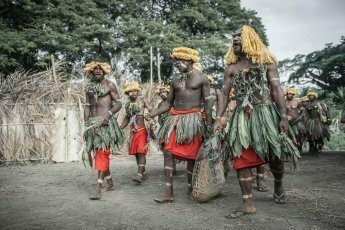 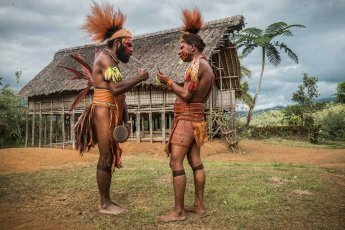 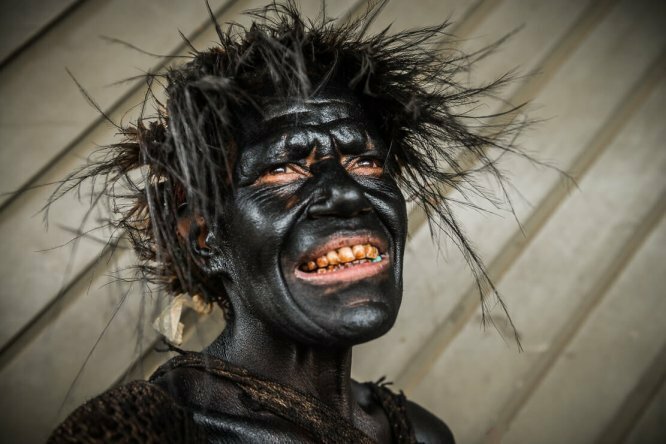 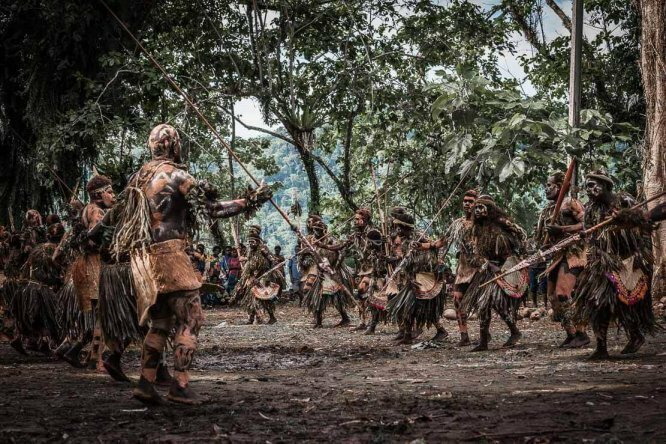 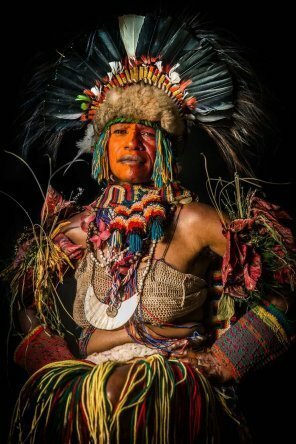 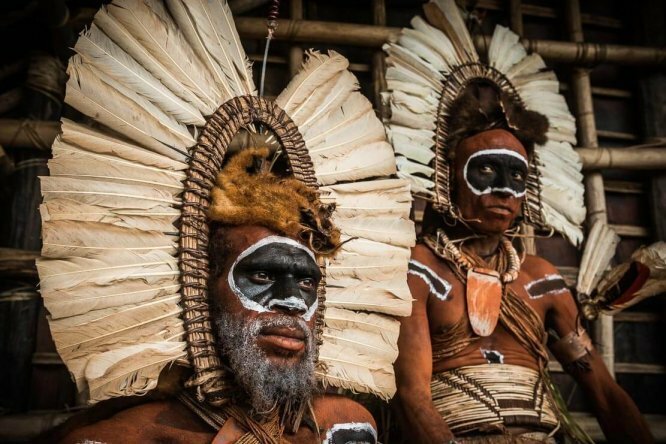 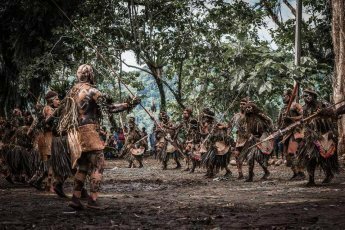 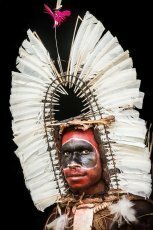 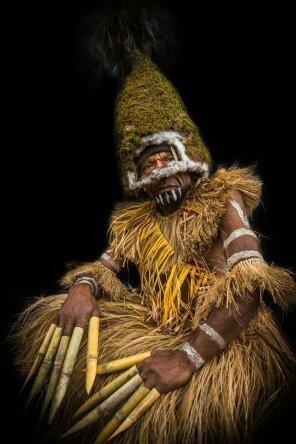 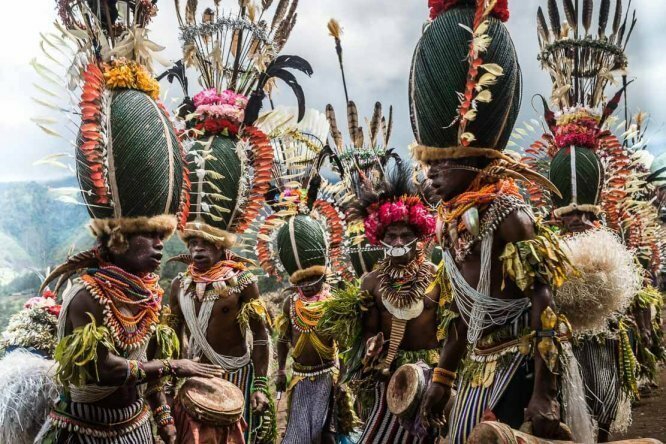 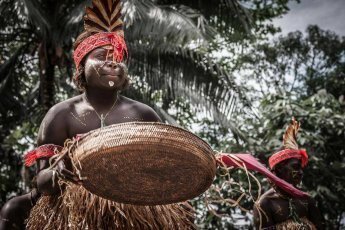 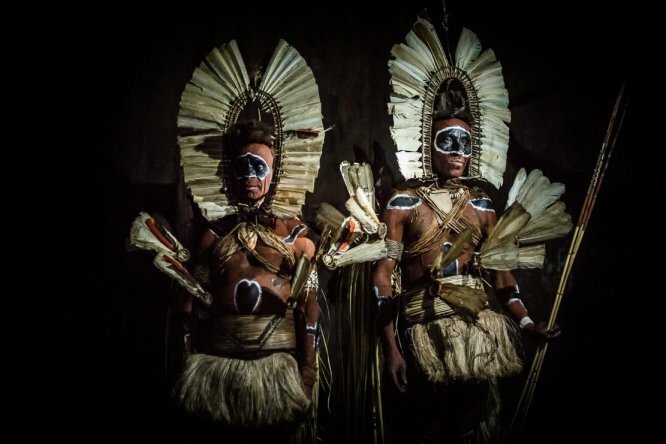 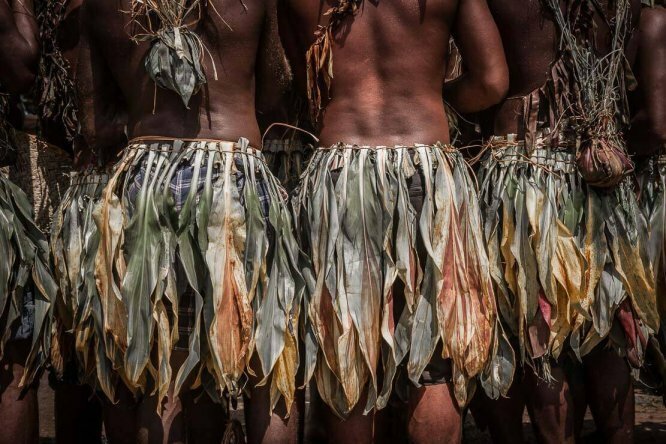 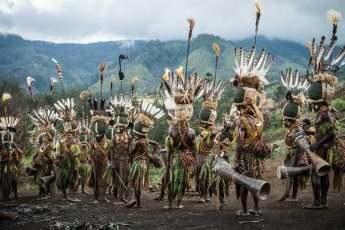 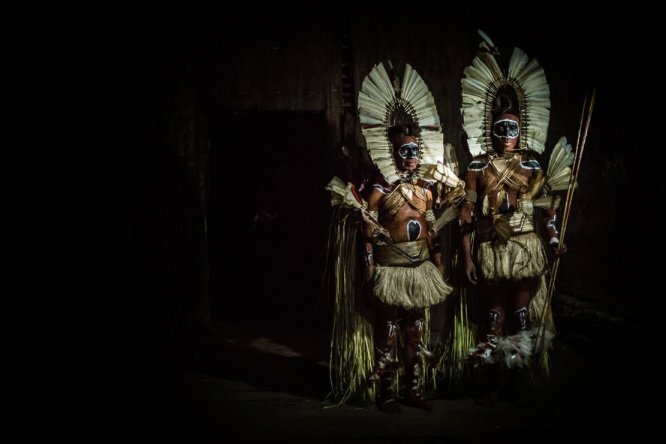 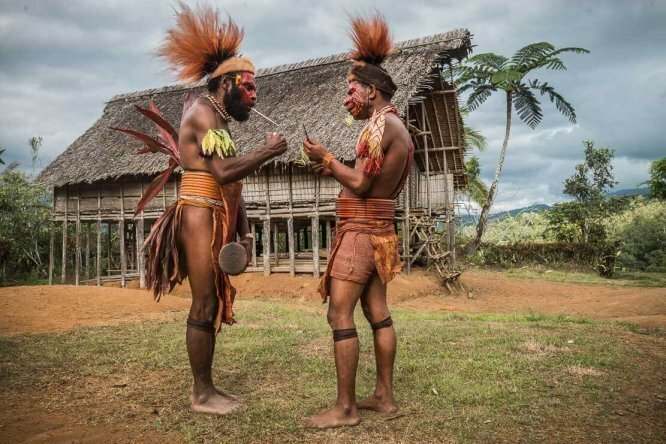 The Engan men wear the hats made of their own hair and grass, similar to the Huli wigmen. 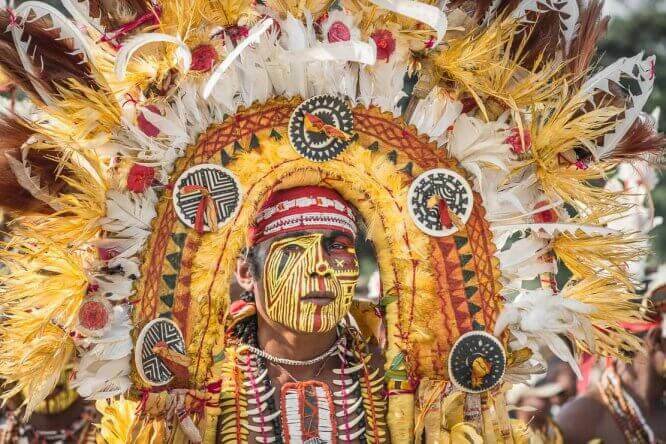 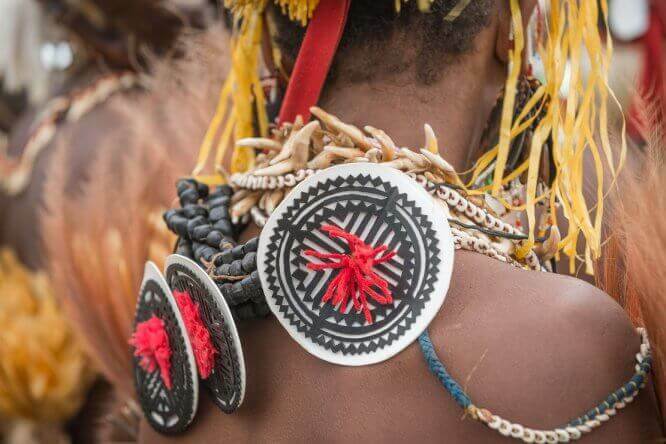 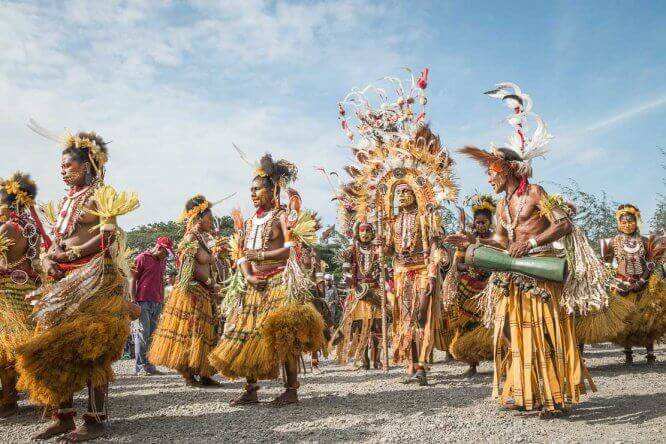 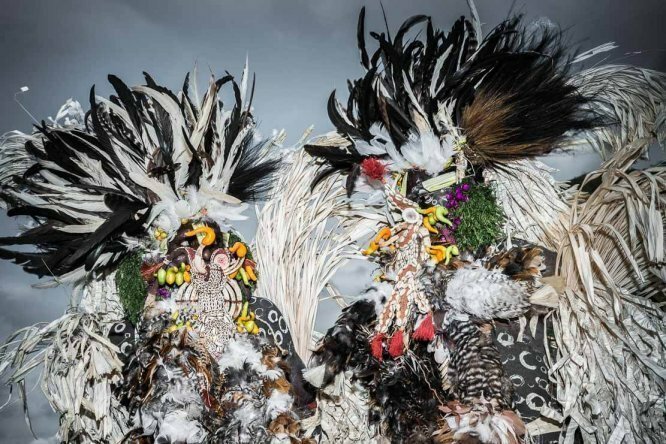 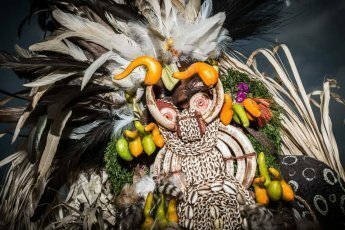 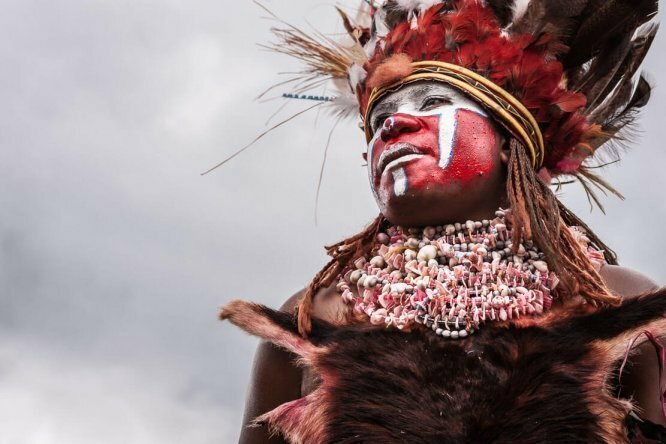 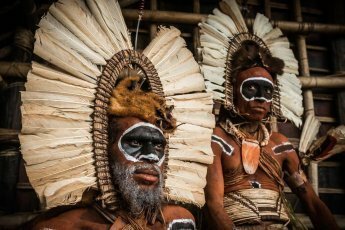 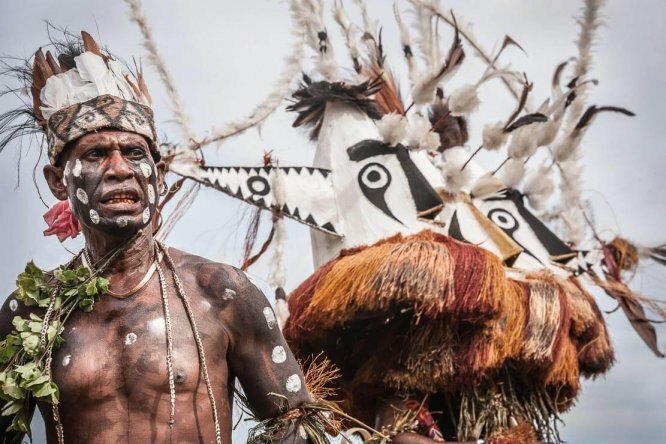 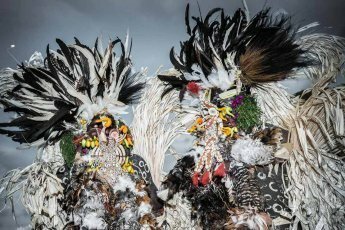 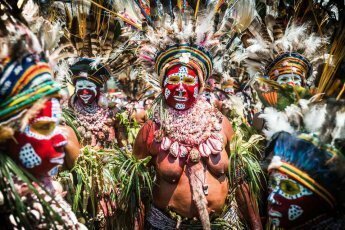 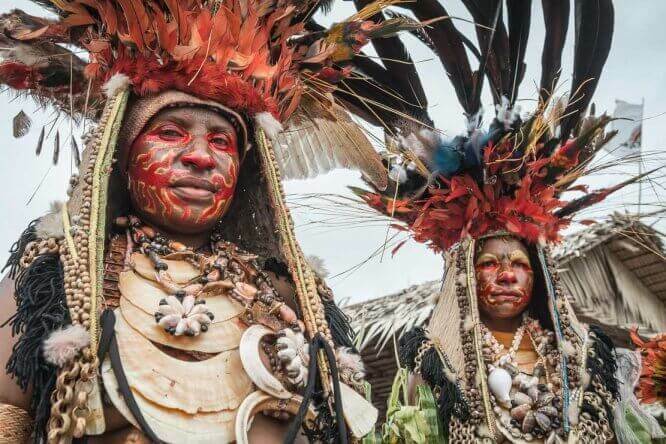 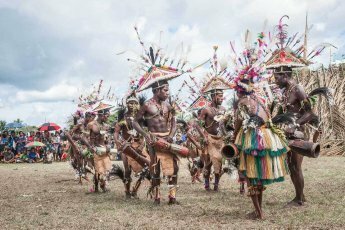 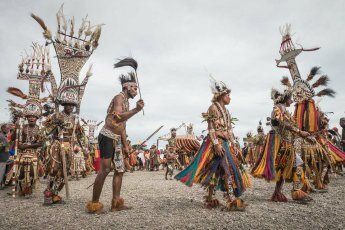 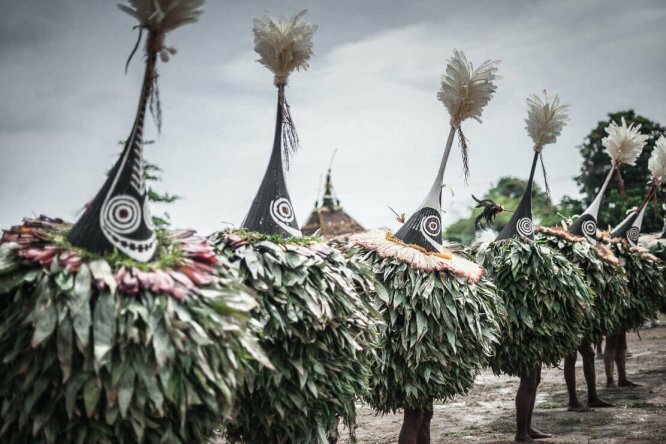 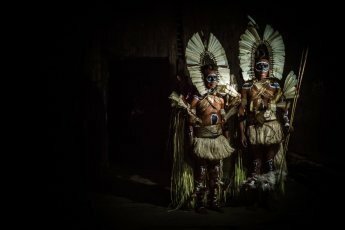 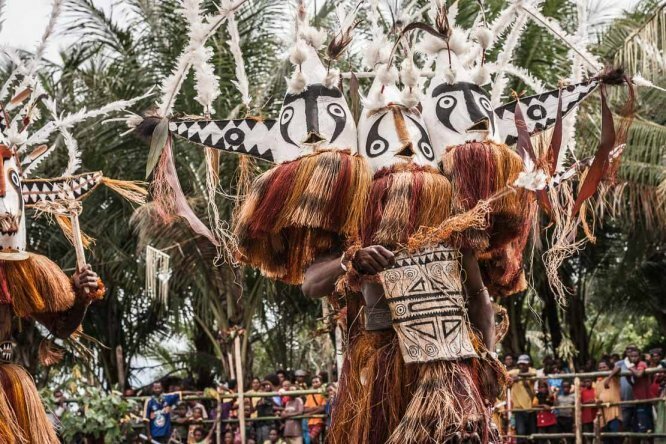 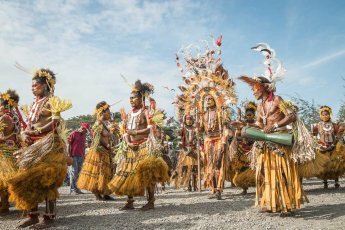 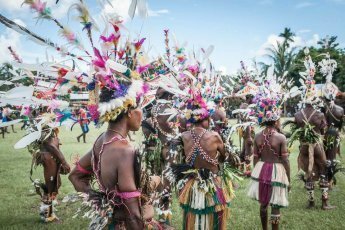 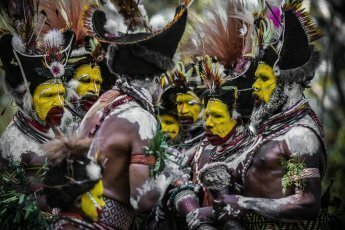 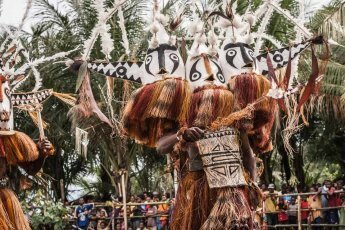 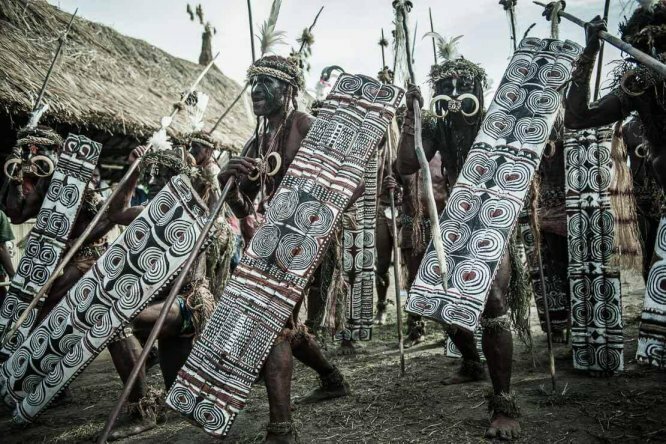 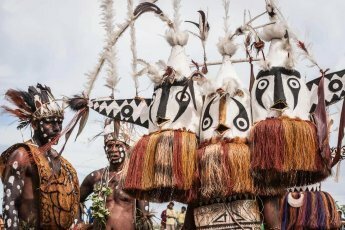 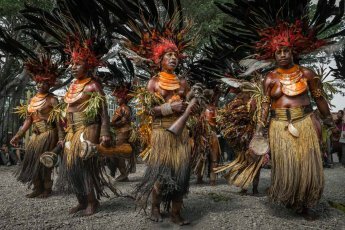 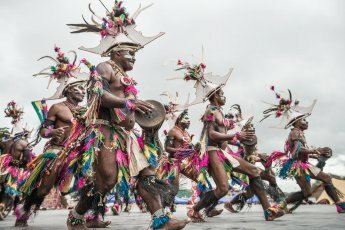 Their distinctive round headdresses, a symbol of Engan culture, are topped with feathers of bird of paradise, eagles, and parrots. 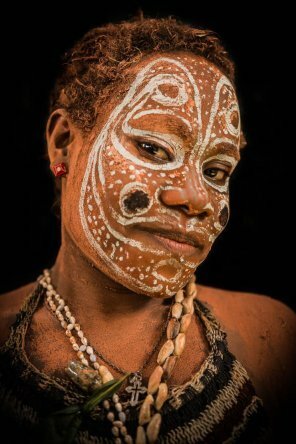 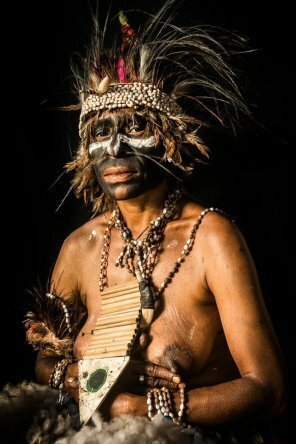 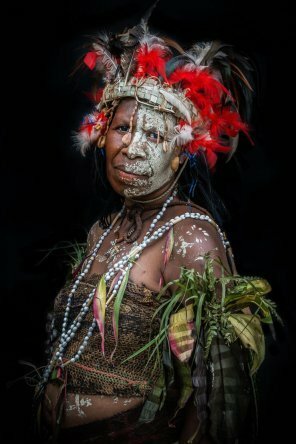 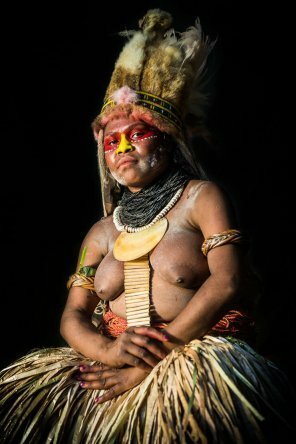 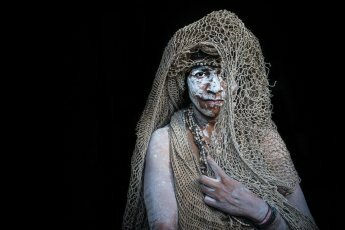 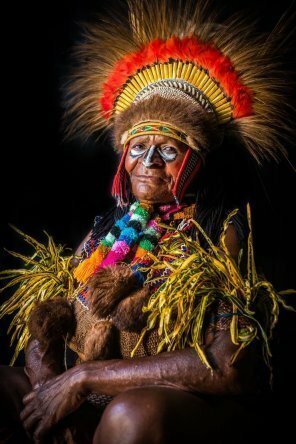 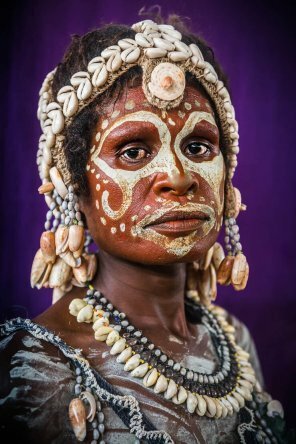 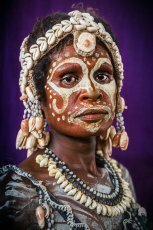 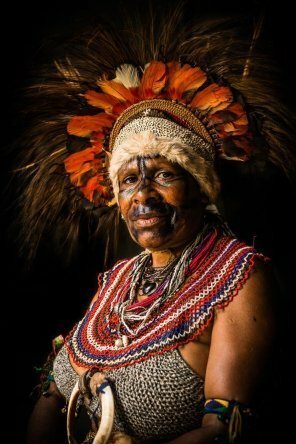 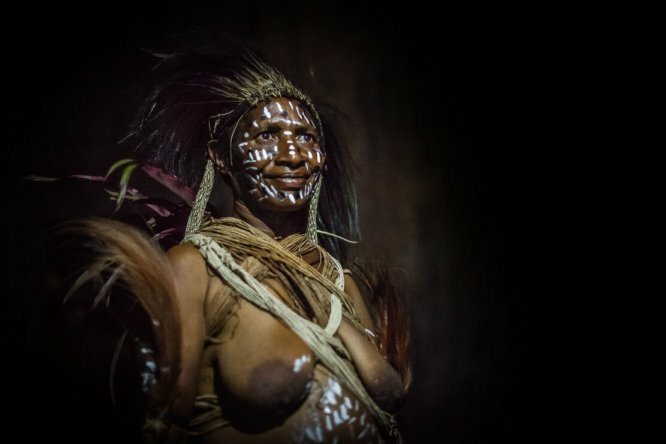 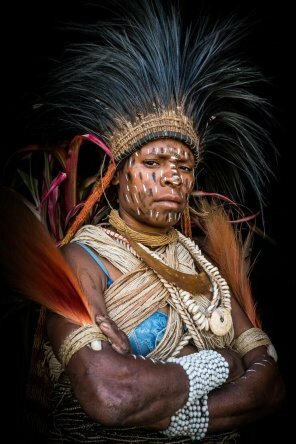 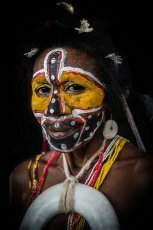 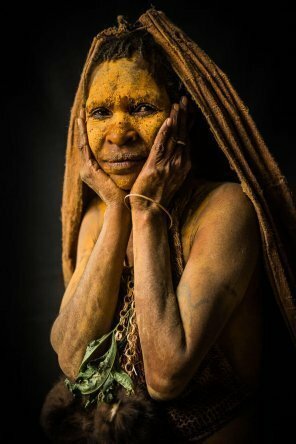 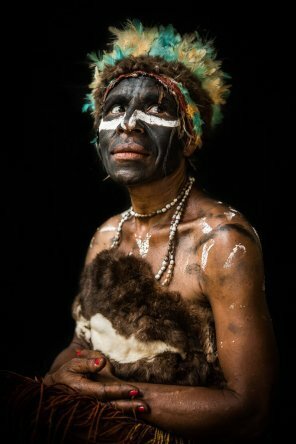 Woman from Kondale village, near Laiagam, Lagaip-Porgera district, Enga Province of Papua New Guinea. 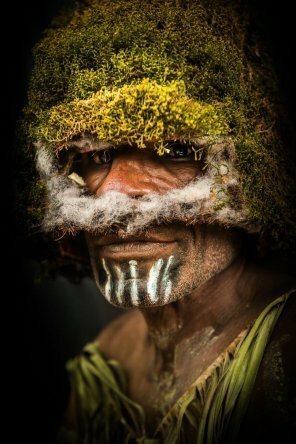 The Engan women, also known as Suli Muli, wear giant hats made of moss and plant fibres. 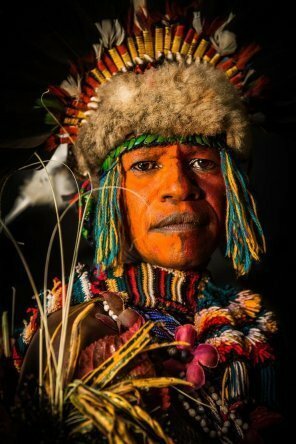 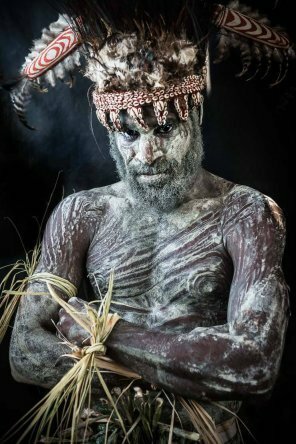 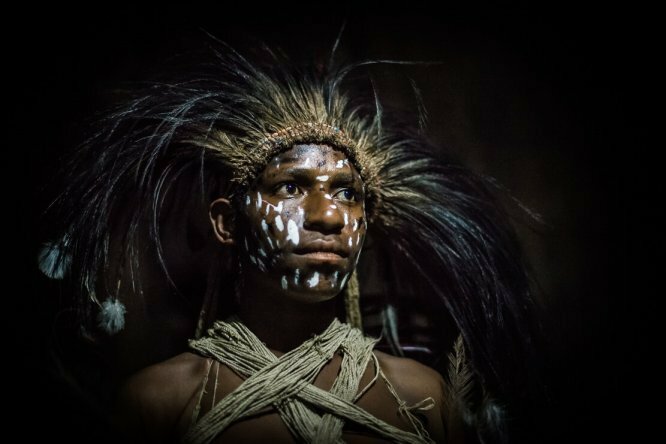 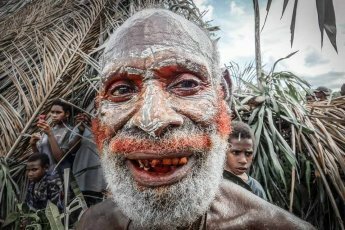 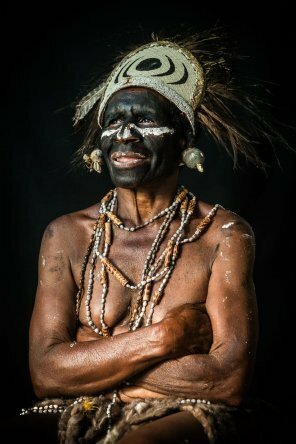 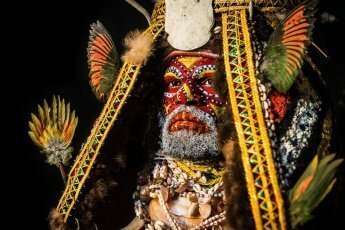 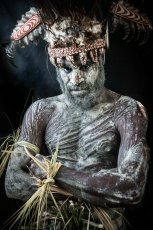 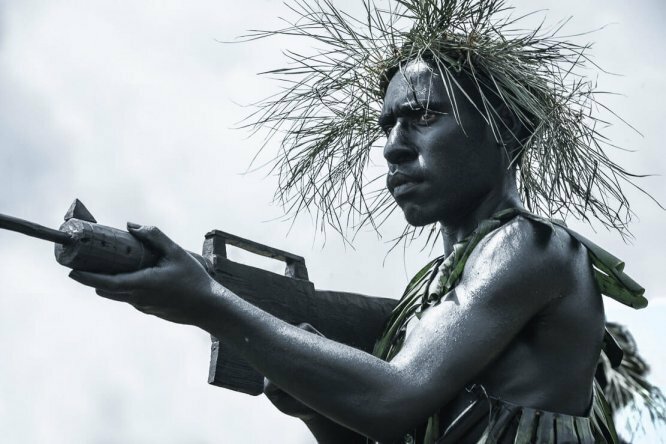 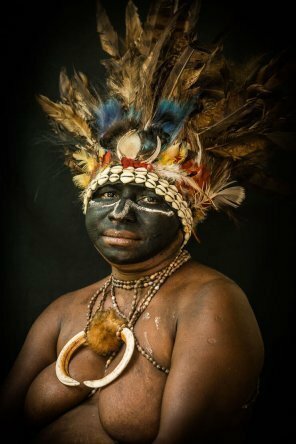 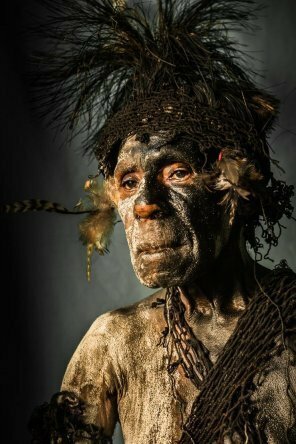 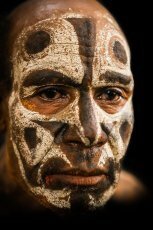 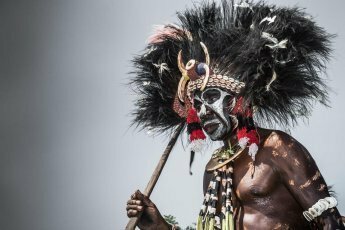 Foi tribesman from Daga village, Lake Kutubu, Southern Highlands Province of Papua New Guinea. 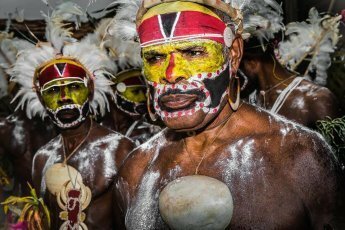 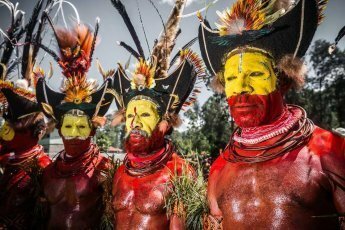 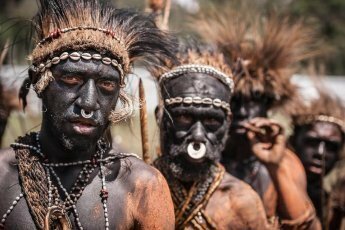 The Foi are recognised by their faces brightly painted in red, yellow and black using special oil. 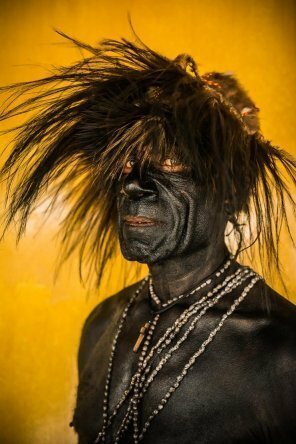 The black colour is used for warriors. 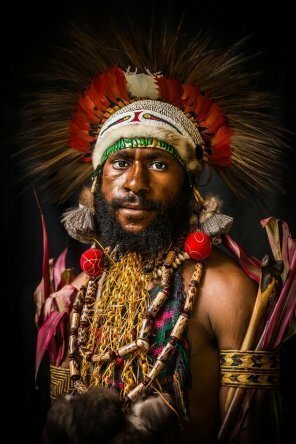 Foi tribesman from Daga village, Lake Kutubu, Southern Highlands Province of Papua New Guinea. 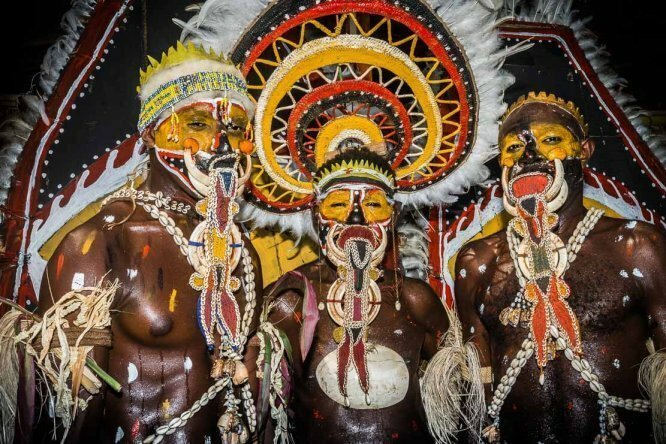 The Foi are recognised by their faces brightly painted in red, yellow and black using special oil. 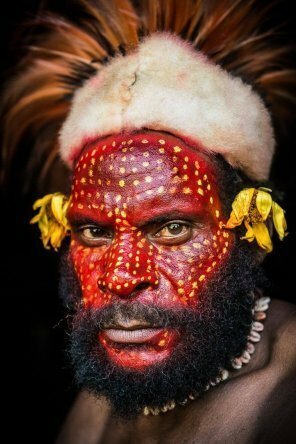 Red colour is used for mature men. 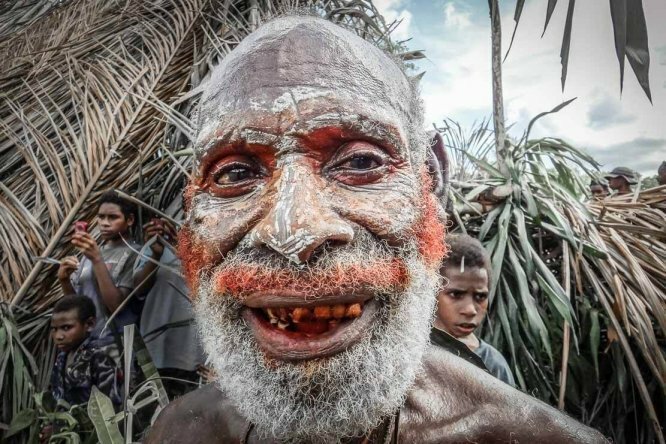 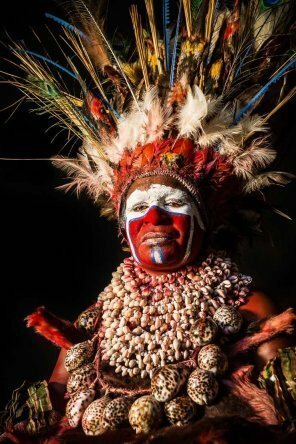 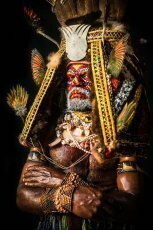 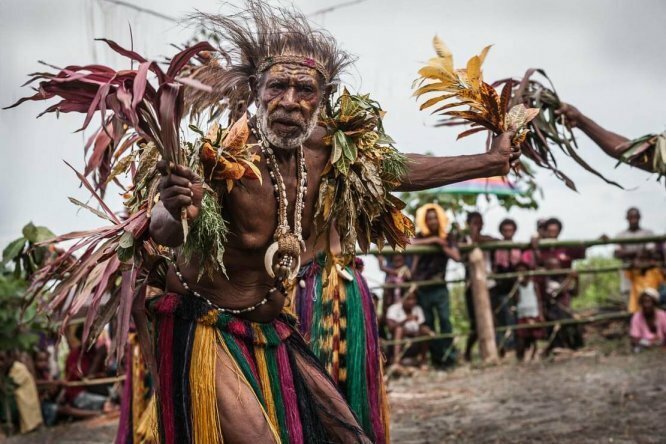 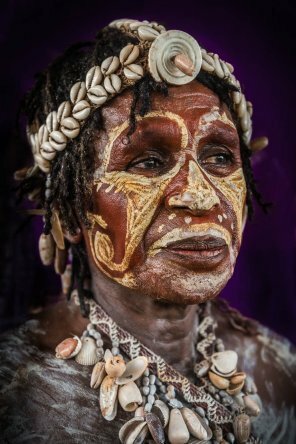 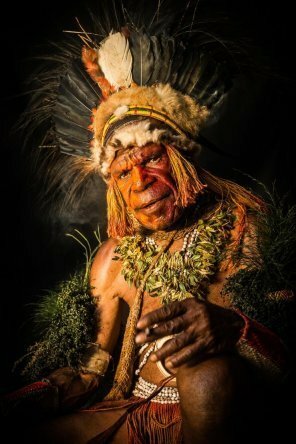 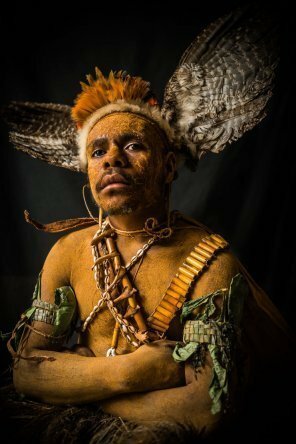 Foi tribesman from Daga village, Lake Kutubu, Southern Highlands Province of Papua New Guinea. 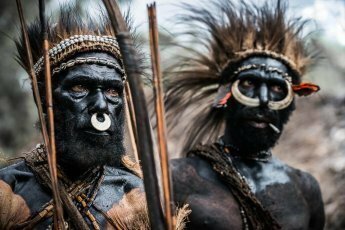 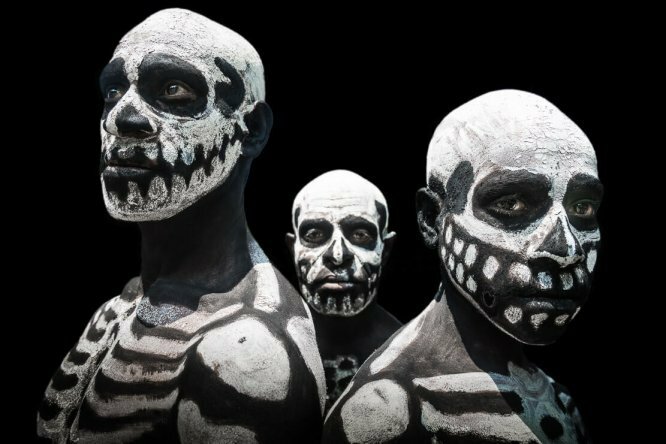 The Foi are recognised by their faces brightly painted in red, yellow and black using special oil. 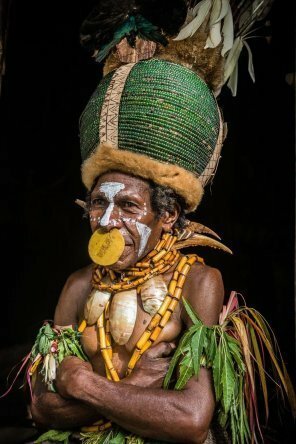 Yellow colour is used for initiates. 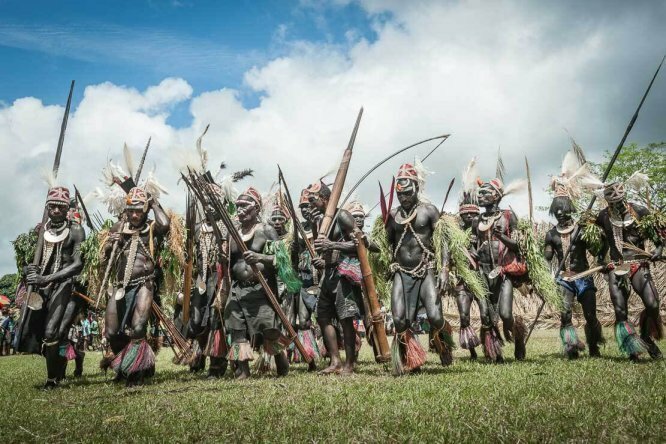 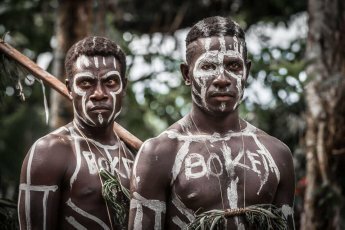 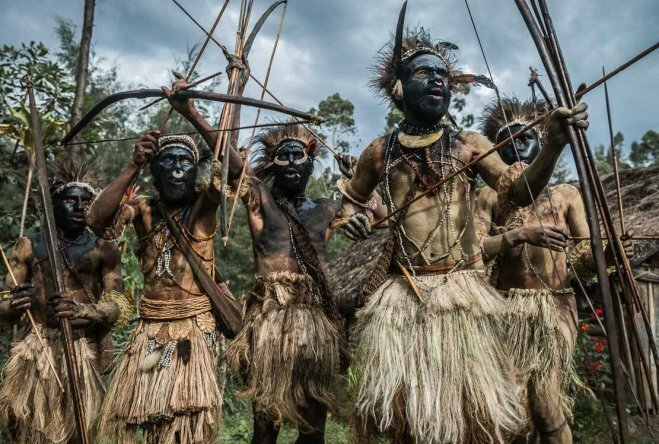 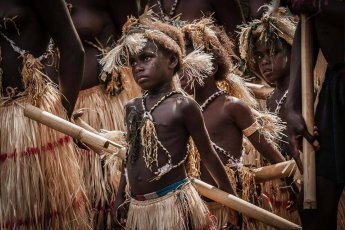 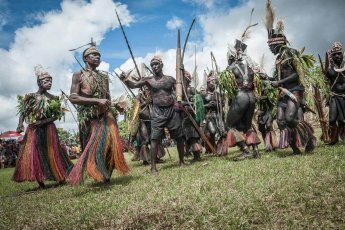 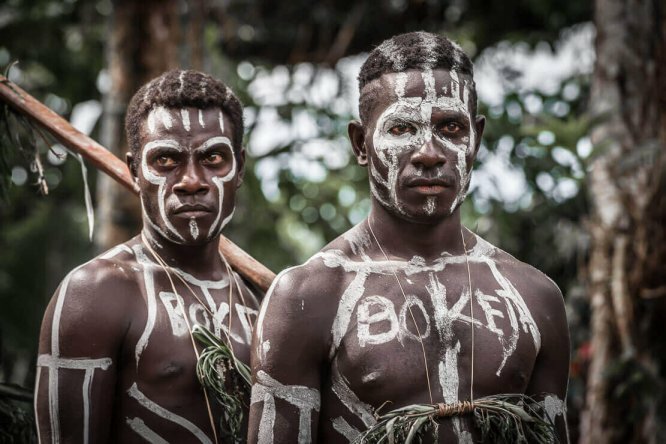 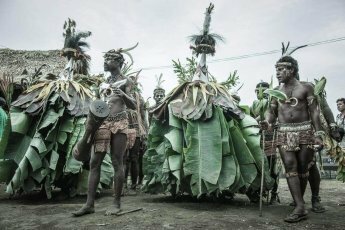 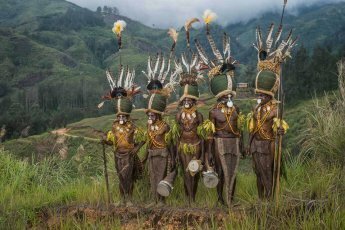 Kaluli tribesmen from Sugu village, Mount Bosavi, Southern Highlands Province of Papua New Guinea. 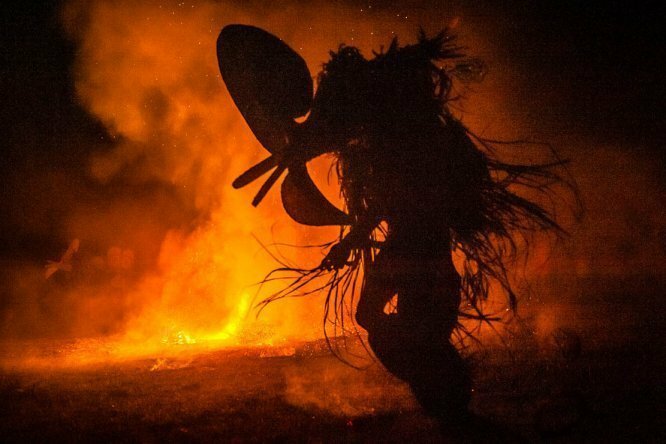 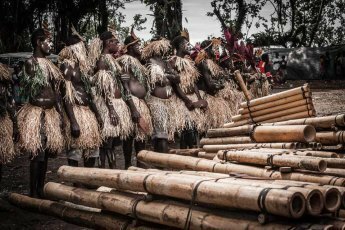 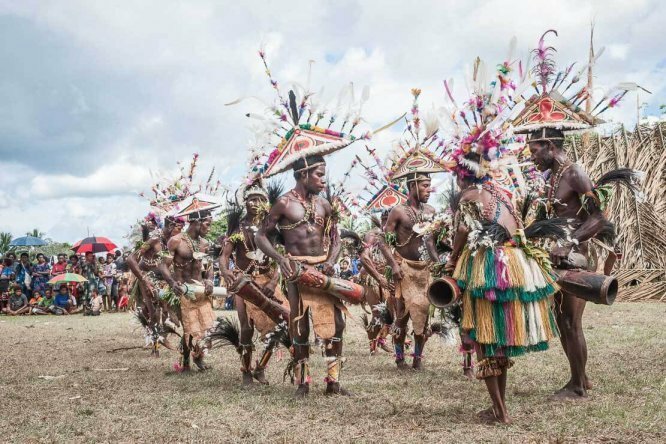 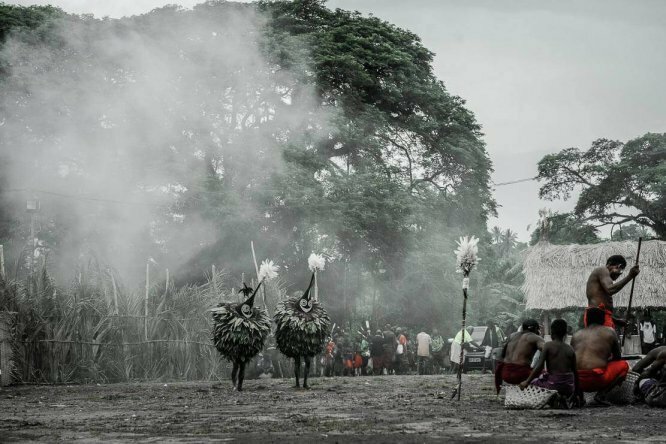 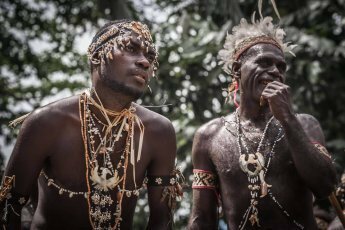 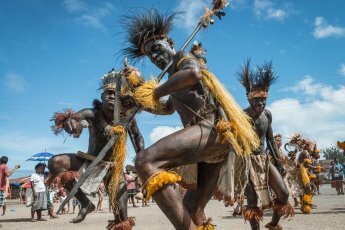 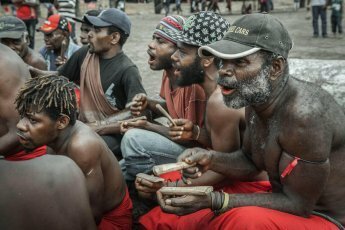 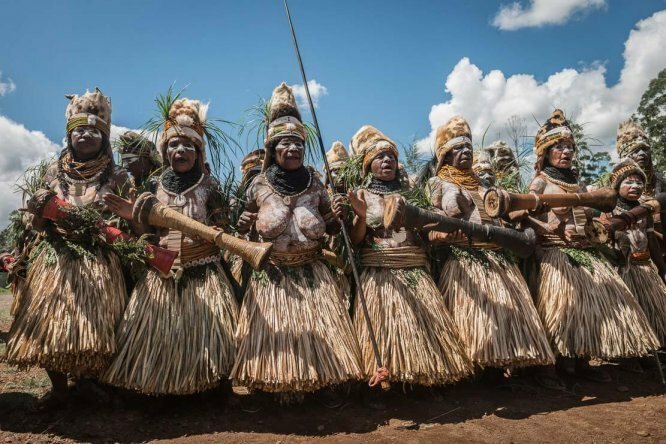 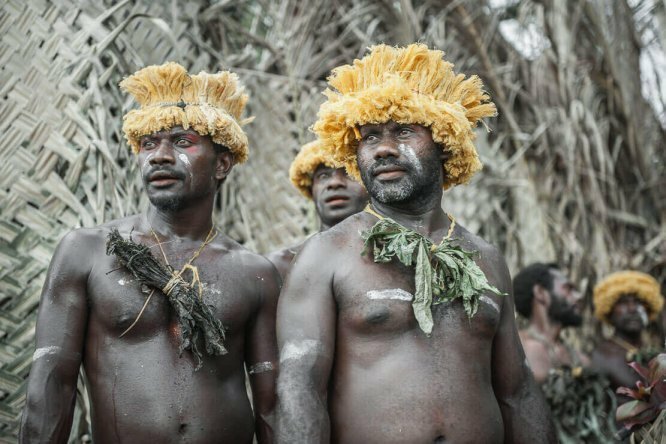 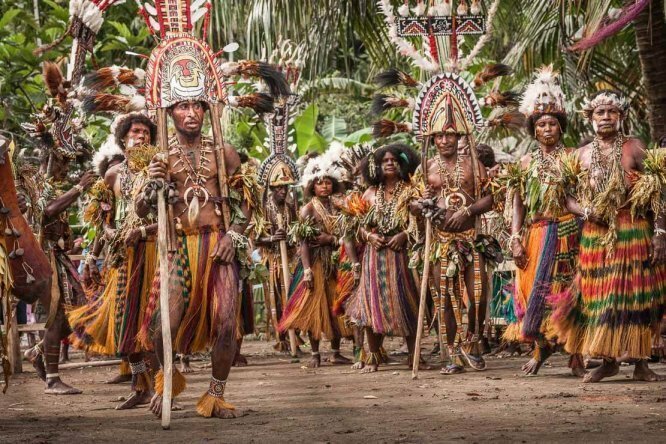 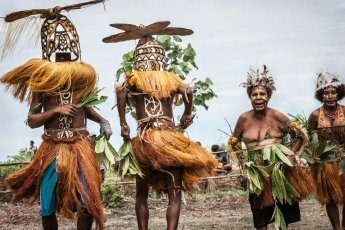 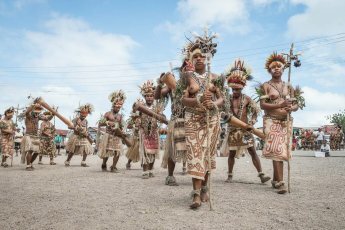 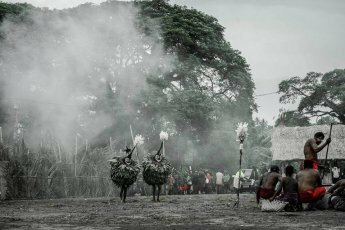 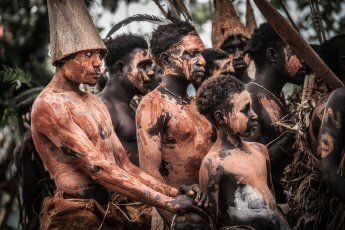 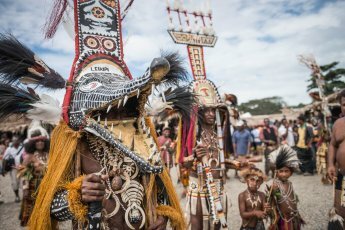 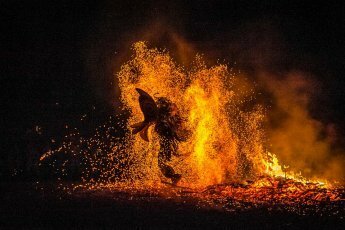 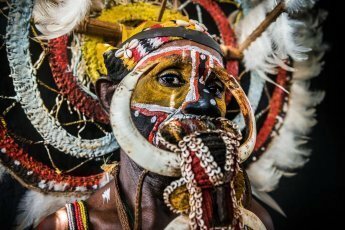 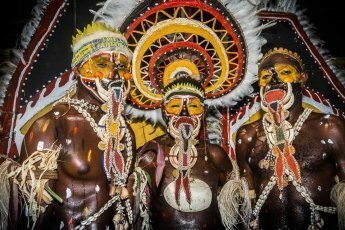 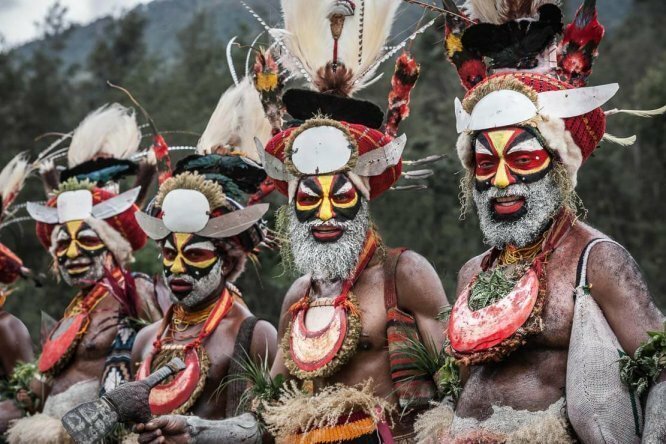 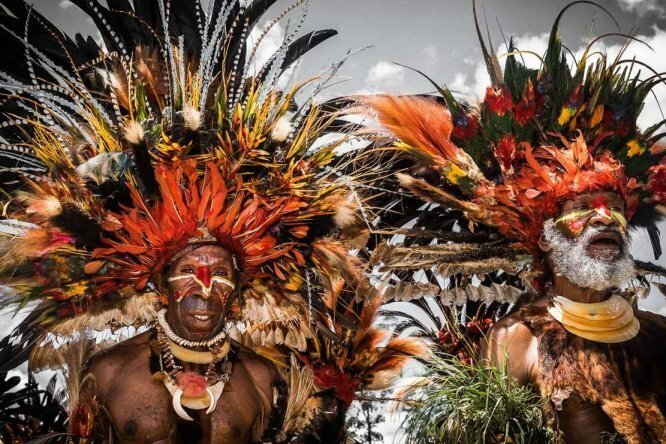 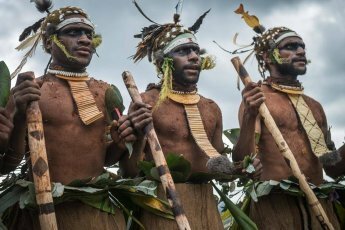 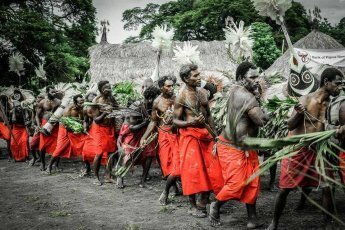 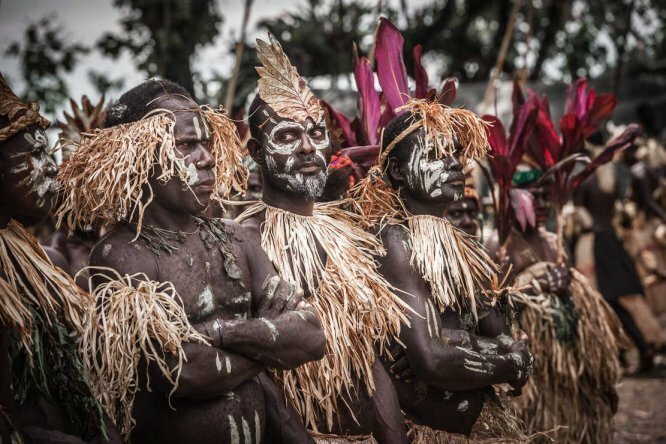 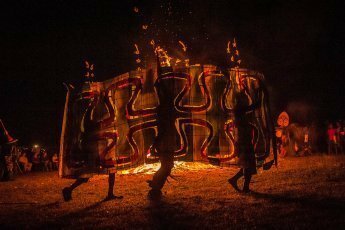 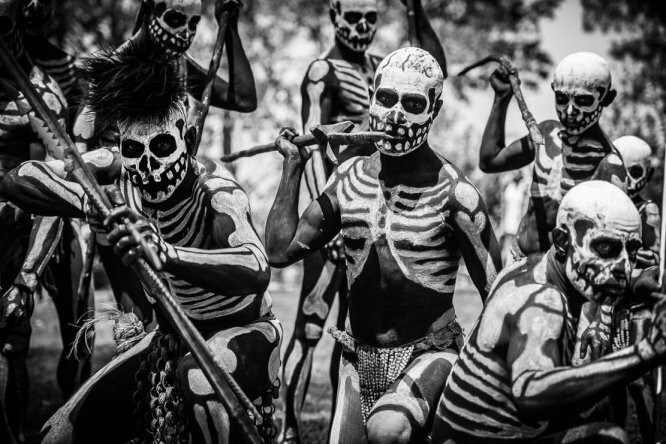 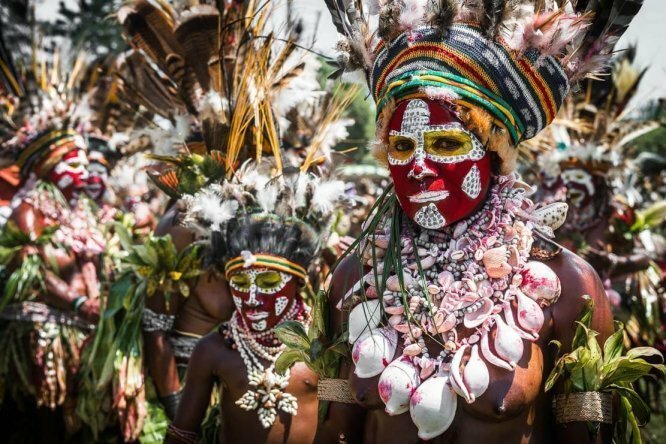 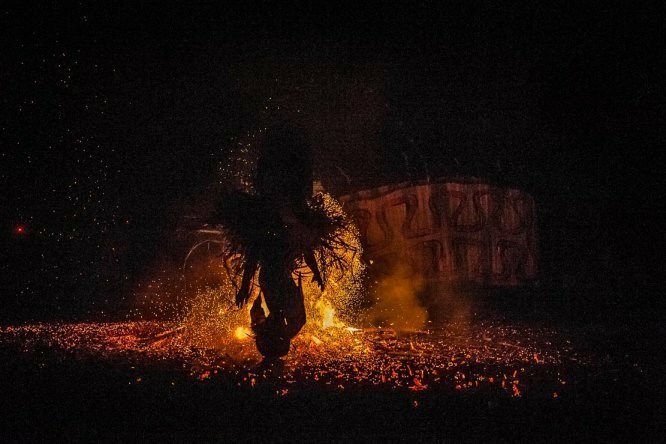 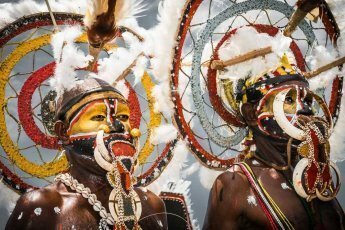 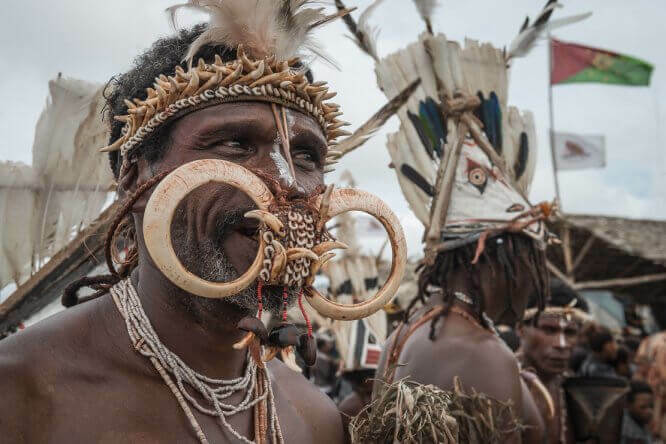 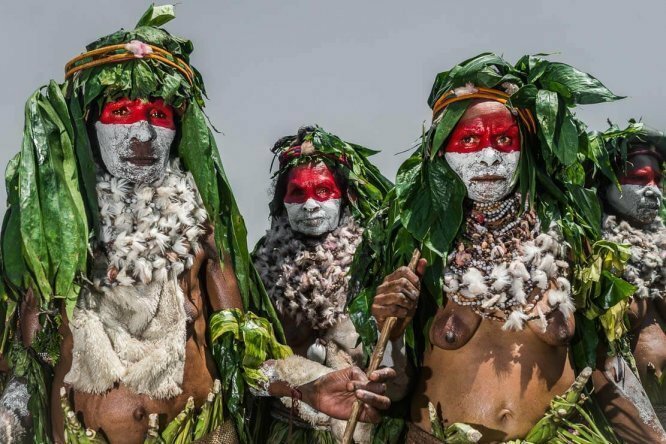 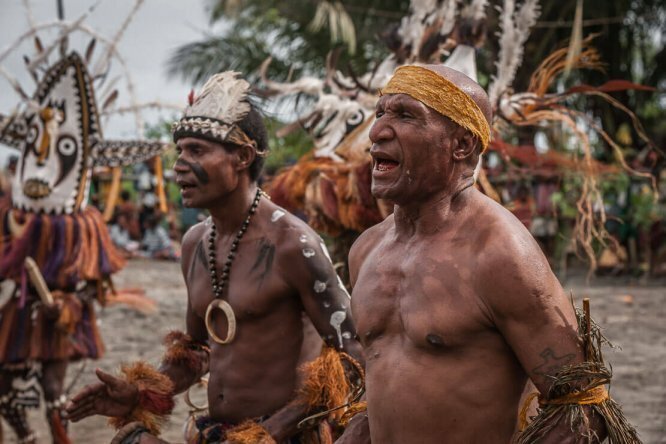 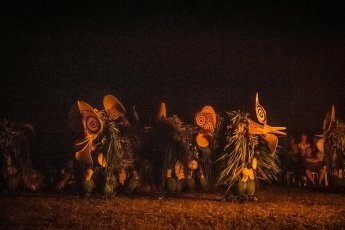 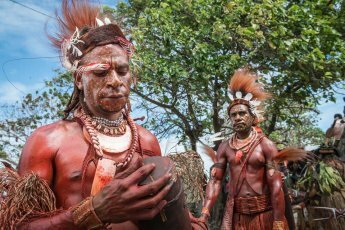 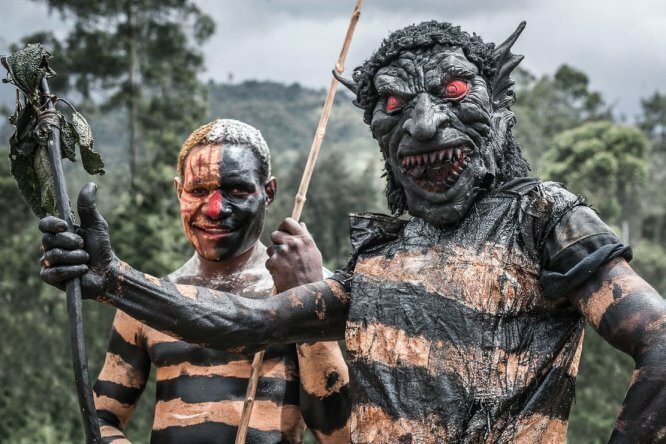 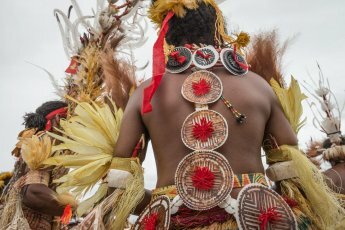 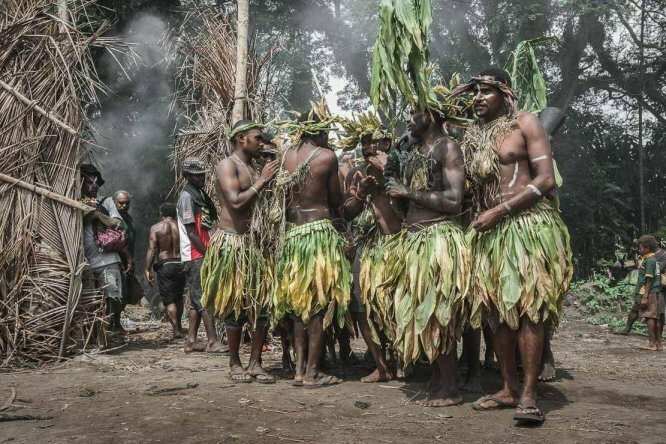 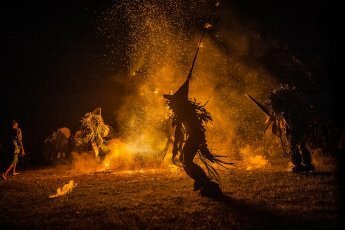 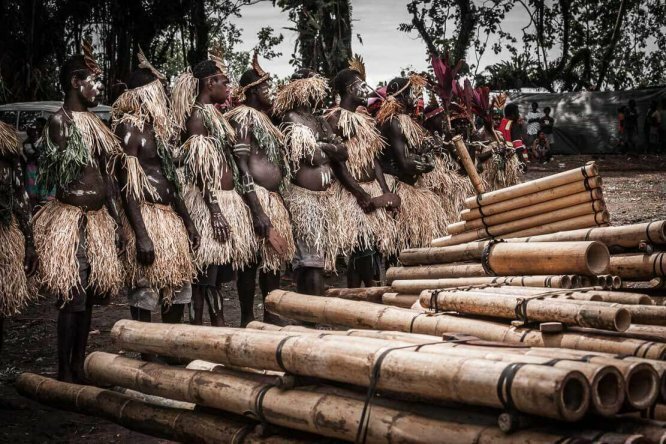 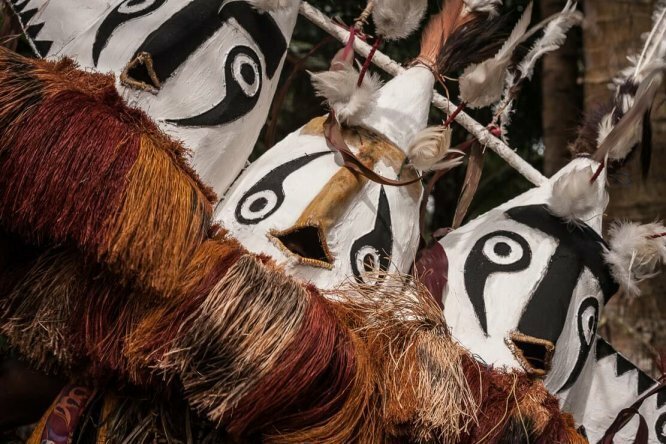 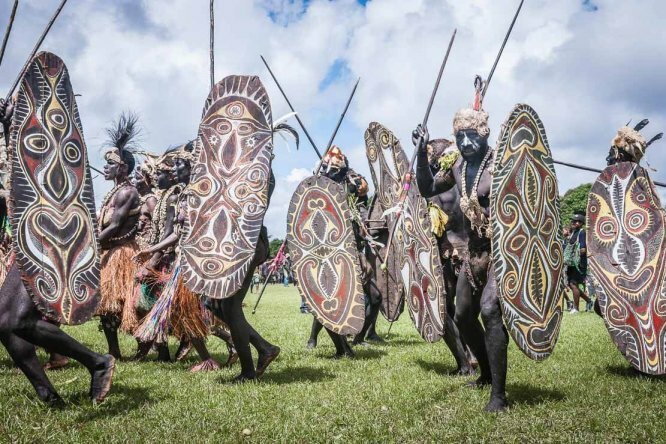 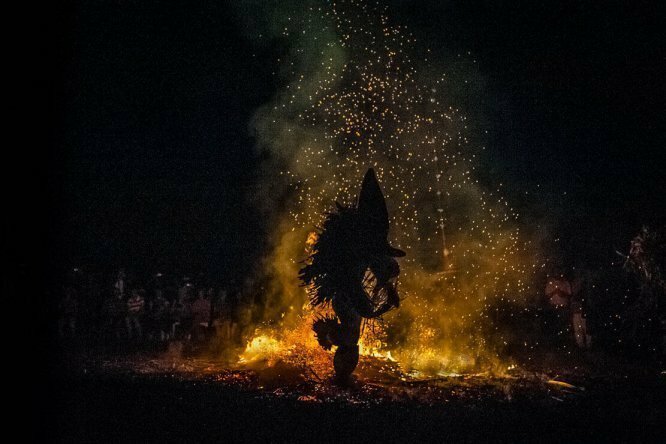 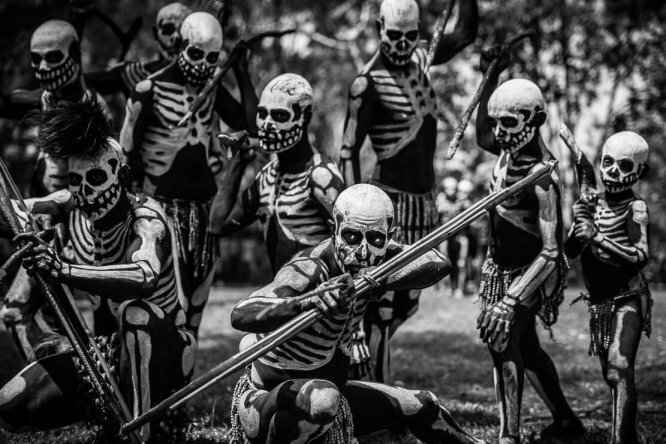 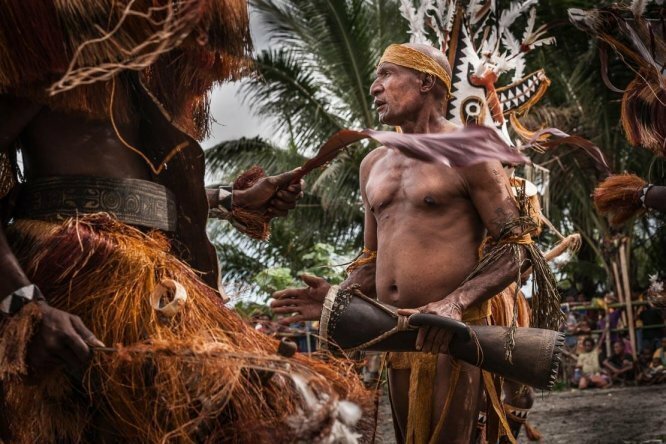 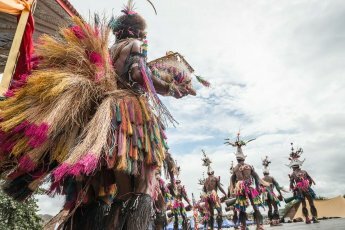 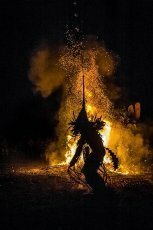 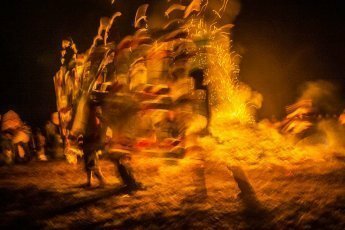 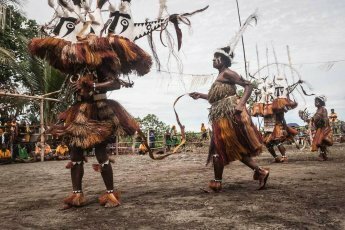 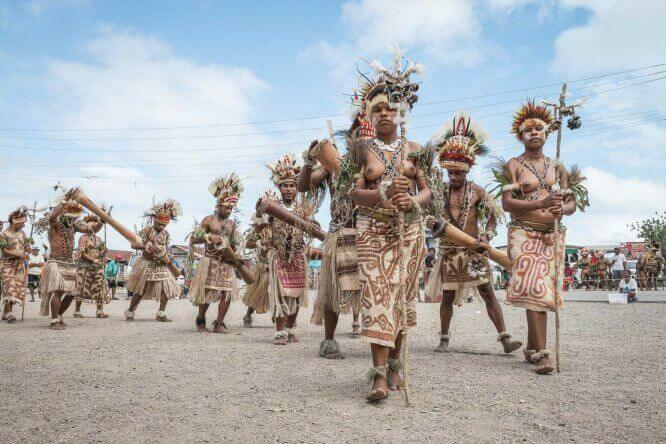 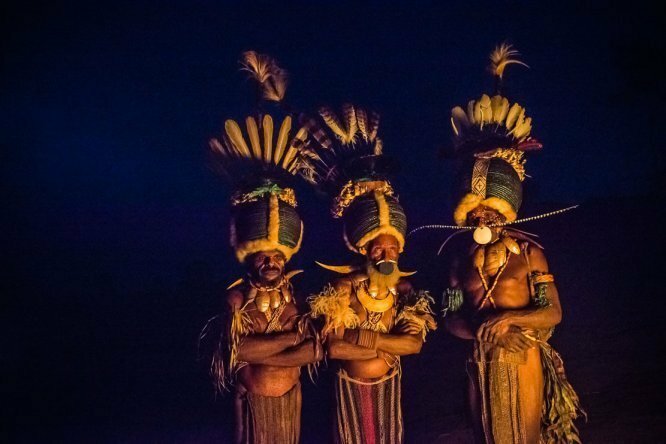 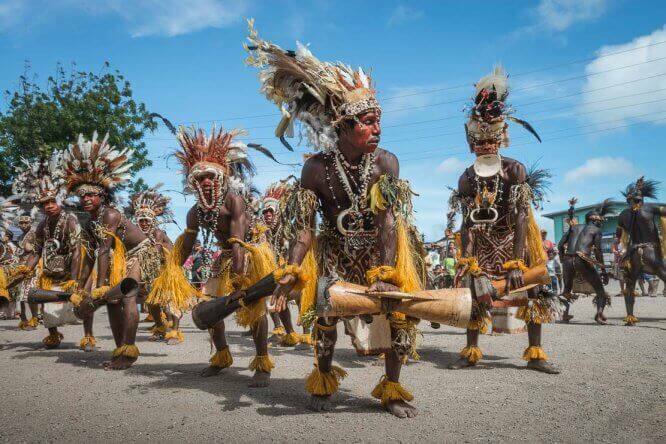 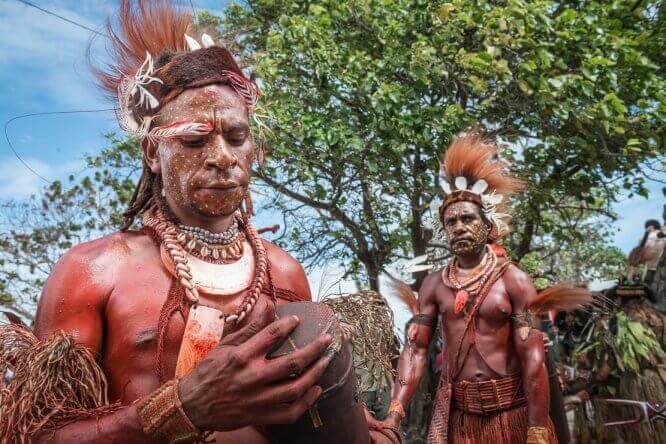 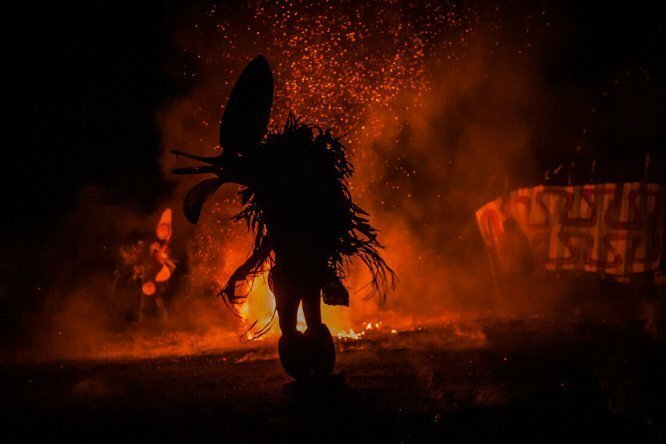 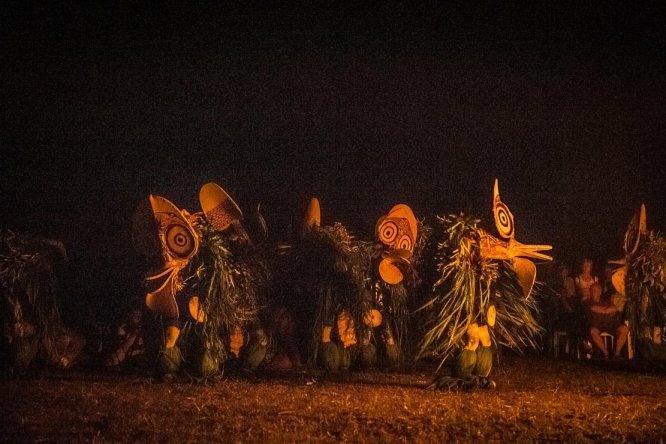 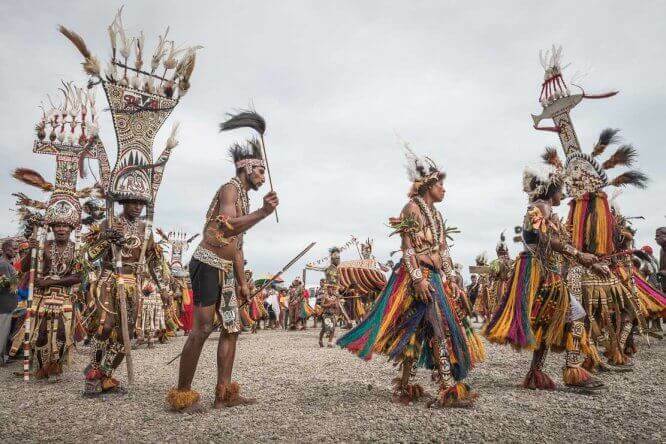 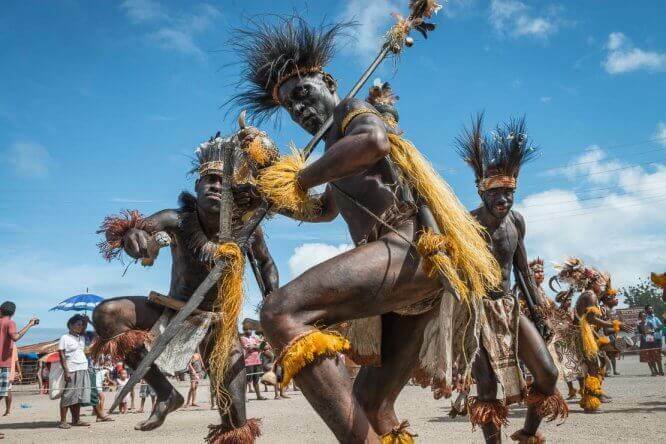 Kalilu men dressed for Gisaro ceremony, also called the “Burning of the Dancers”.